Improve the overall connectivity of the street network to enhance the mobility of pedestrians, bicyclists, transit users, automobile drivers and emergency providers. Align and connect all new streets in public and private projects with public streets in adjoining properties. Where possible, improve the connectivity of existing cul-de-sac roads, especially for the convenience of pedestrians and bicyclists. To improve the connectivity of long blocks, create common green areas that provide paths for pedestrians, bicyclists and emergency providers. 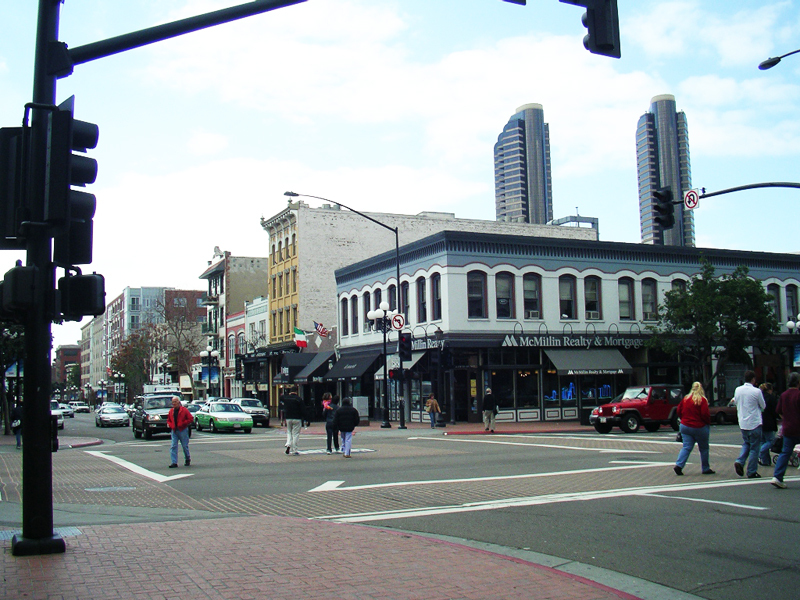 Establish a street connectivity ordinance that is customized to various local factors, such as topography, natural features, climate, desirable historical precedence, etc., to decrease the length of out-sized blocks (maximum length of 660 feet or a maximum of 1,600 linear feet perimeter) and increase the frequency of intersections (maximum distance between full movement intersections should be no more than 1/4 mile). Calm traffic to a desired speed that respects all modes of travel through the design of travel way and intersections. Provide 9- to 10-foot wide travel lanes for an associated speed of 20-25 mph. Provide 10- to 11-foot wide travel lanes for an associated speed of 30-35 mph. Provide on-street parking to help achieve the above desired speeds. Include the width of the gutter pan when measuring lane widths for vehicles, bicyclists and parking. 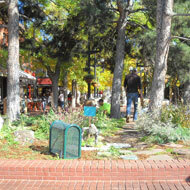 Provide trees in medians and along sidewalks to maximize sense of enclosure and calm. 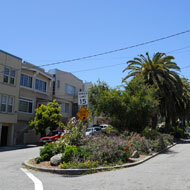 Explore traffic calming elements, such as bulbouts, roundabouts and traffic circles, at intersections. 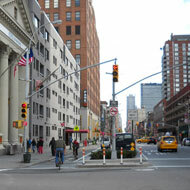 Emphasize safety of all users in the design of intersections. Prioritize safety of the most vulnerable users of the street. Provide adequate ADA access, including truncated domes and appropriate cross slopes. Make intersections as compact as possible and avoid free-flowing movements. 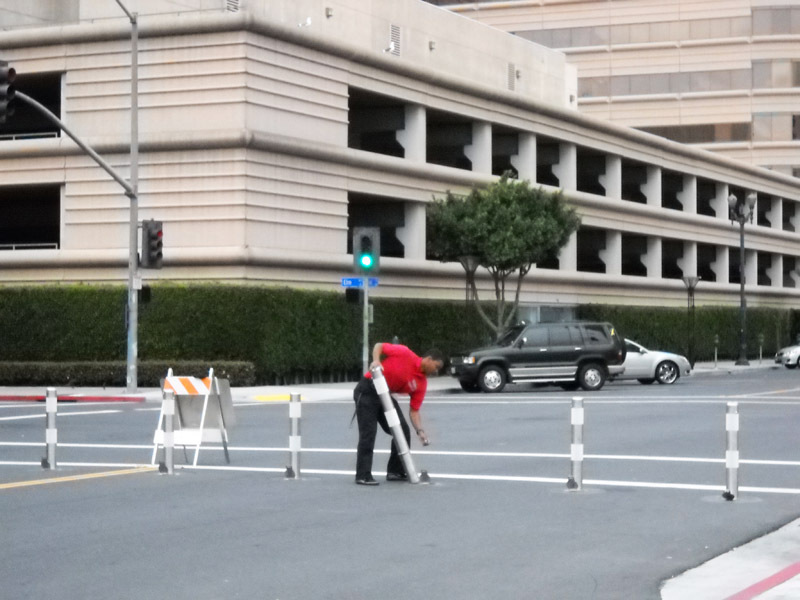 Utilize access management practices to remove additional vehicular conflict points near the intersection. Design intersections at close to a right angle. Redesign skewed intersections through the purchase of adjoining property or use of elements such as roundabouts. Design corner radii to minimize crossing distances and slow vehicular turning speeds by keeping a passenger vehicle as the default vehicle and the corresponding radii of 15 feet. Allow larger infrequent vehicles to encroach upon multiple departure lanes and part way into opposing travel lanes. Allow crossings on all legs of an intersection, unless there are no pedestrian access destinations on or near one or more of the corners. Place crosswalks as close as possible to the desire line of pedestrians, which is generally in line with the approaching sidewalks. Create pedestrian refuges if the crossing distance exceeds approximately 40 feet. Provide curb extensions to replace the parking lane at crosswalks to reduce pedestrian crossing distances and improve visibility between pedestrians and vehicles. Use signals, signal timing and operations techniques to improve mobility and safety of all users. Whenever feasible, provide signal progression at speeds that support the target speed of a corridor. 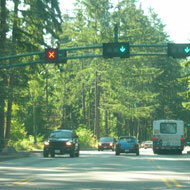 Provide short signal cycle lengths, which allow frequent opportunities to cross major roadways. Ensure signal timing does not hinder bicycle and foot traffic or provide insufficient crossing times. Explore leading pedestrian intervals where the pedestrian WALK sign is displayed 2 to 5 seconds prior to the concurrent green interval to enable pedestrians to enter the crosswalk before the drivers turn, increasing the chances of being seen by drivers. Prohibit right turn on red where there are restricted sight lines between motorists and pedestrians. Use pedestrian user-friendly intelligent (PUFFIN) signals, which detect slower pedestrians in crosswalks and add clearance interval time to the pedestrian signals. Use pedestrian scrambles where turning vehicles conflict with very high pedestrian volumes. Ensure that signals detect bicycles. In urban areas and at locations with many crossing pedestrians, time the pedestrian phase to be on automatic recall, so pedestrians do not have to seek and push a pushbutton. Where push buttons are necessary, locate them at convenient locations. Use roundabouts on major corridors to improve the intersection capacity and overall safety. Size roundabouts with central diameters from 12 feet to 90 feet to fit a wide range of intersections and accommodate through movements and different turn movements by various design vehicles. Use multi-lane/two-lane roundabouts sparingly, and only when single-lane roundabouts prove to be inadequate for the traffic volume, such as at freeway interchanges. 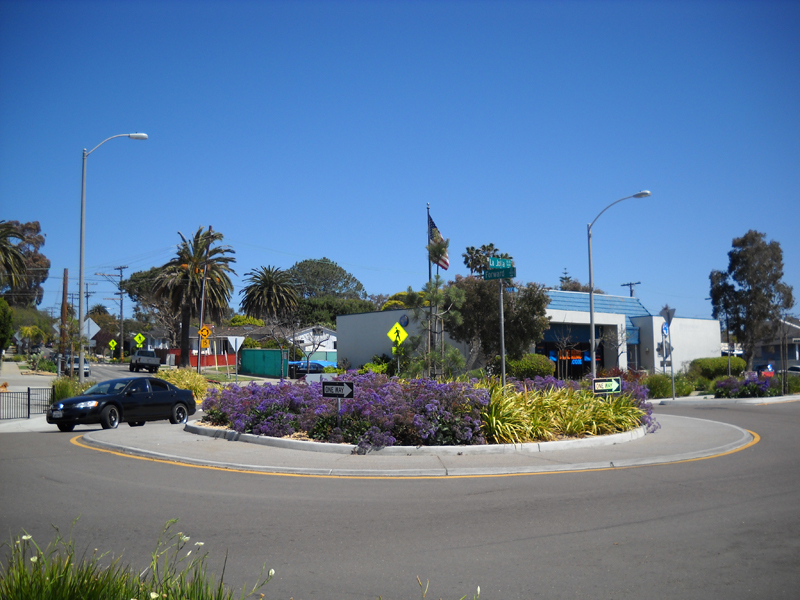 Rather than a large multi-lane roundabout, construct a smaller, multi-lane roundabout with metering signals that is adequate during the non-commute hours of the day. Use the metering signal for the short peak period when congestion can occur. Design the center island so that, in conjunction with well-designed approach and departure lanes, it can control vehicle speeds through deflection. Maximize opportunities to landscape the intersection. Provide adequate wayfinding cues, including truncated domes for sight-impaired people, that allow pedestrians to safely navigate the roundabout. 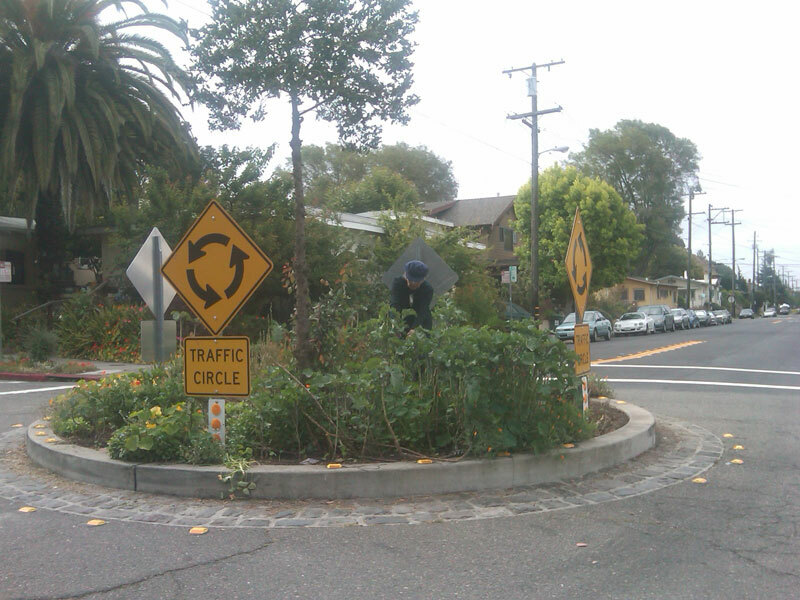 Use traffic circles on low-volume, local neighborhood streets. Locate traffic circles on local streets where there is a need to achieve target speeds of approximately 15 to 18 mph. Size traffic circles to fit a wide range of intersections and accommodate through movements and different turn movements by various vehicles. 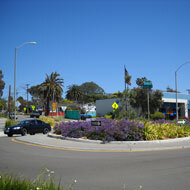 Explore landscaping of traffic circles to achieve the desired calming. Implement multi-way boulevards where there is a need to combine efficient through-traffic travel with calmed local access lanes for neighborhood commercial and residential use. Design the central roadway with through lanes operating at traffic between 30-45 mph and with through travel lanes that are 10 feet to 11 feet wide. 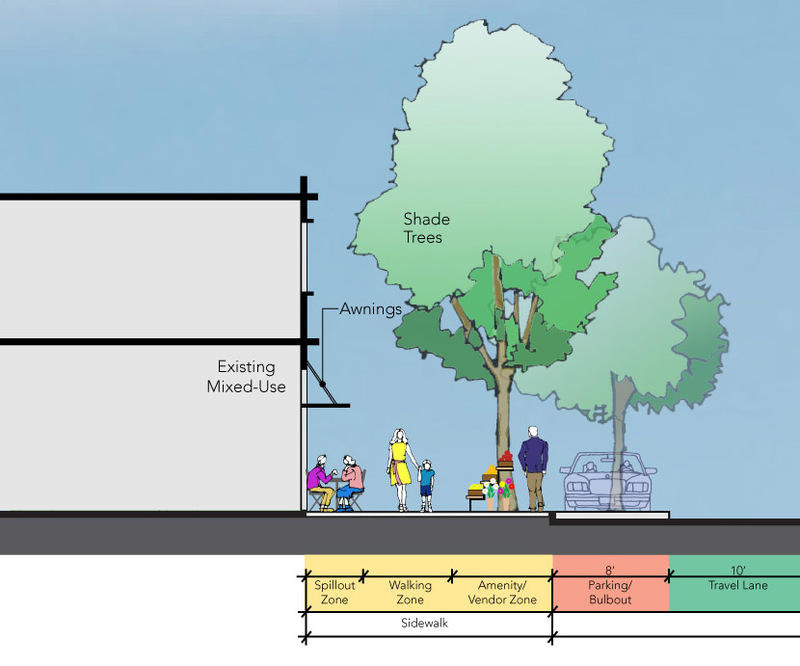 Design the side access roads for 10-20 mph with a 7-foot wide street parking lane and a 9- to 10-foot wide shared vehicle and bike travel lane. The travel lane width of the access road must be narrower than the through travel lane. Maximize space for medians, especially side medians, to allow space for canopy trees, street lighting, bus stops with seating/shelters, and pedestrian refuge. Prioritize space for medians over sidewalks. 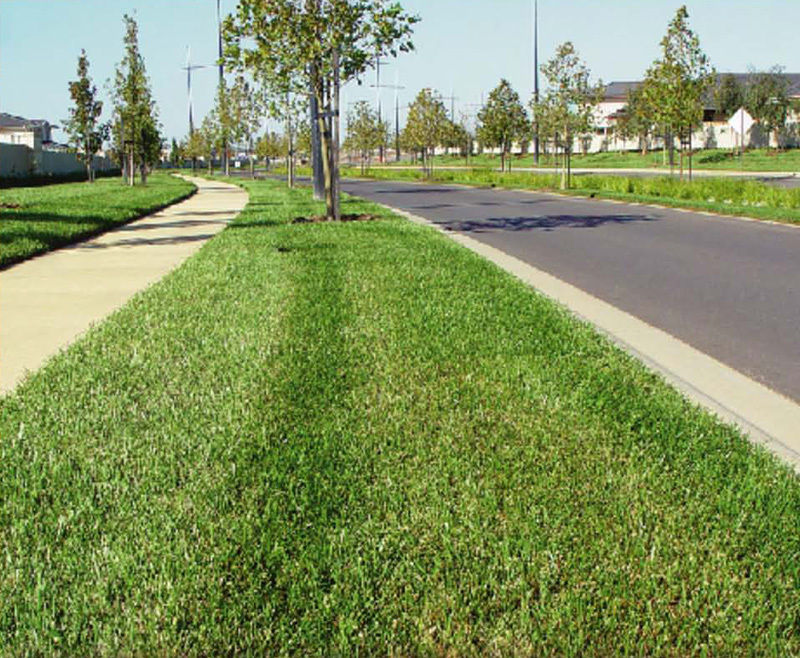 Ideally, central and side medians should be 10 inches to 30 inches wide to allow for trees, shrubs, etc. Design side access roads to have a different character through use of special paving that enhances its pedestrian-friendly character. 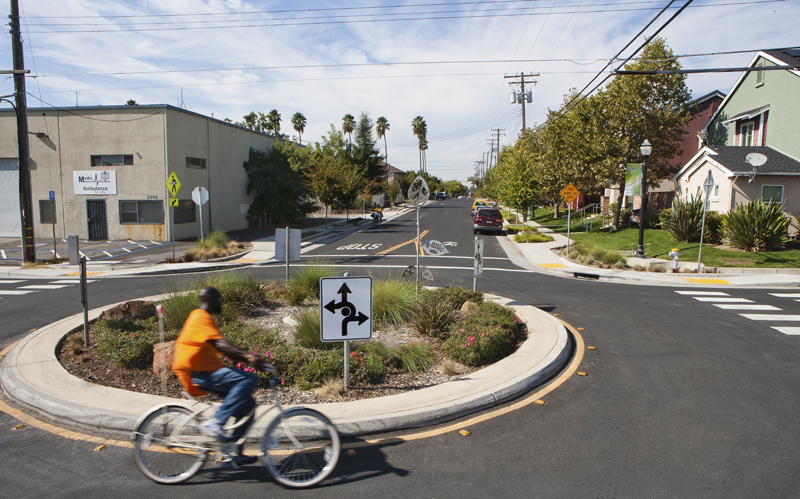 Explore traditional and non-traditional intersection design to address the specific needs of traffic turning movements, local access, bike access and connectivity, etc. Design local and low volume streets for shared space that is accessible to both pedestrians and vehicles, and to allow pedestrians to move more freely within the entire right-of-way of the street. Locate streets where there is a historical precedence, traditional community patterns, and where there is a need or willingness for the automobile driver to share the road. Design streets to accommodate the right mix of traffic volumes and traffic speeds (20 mph being the maximum upper threshold) to mitigate impacts to the free flow of pedestrians. 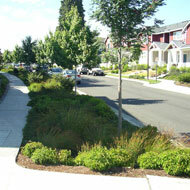 Design streets with level surfaces such that the street surface is not physically divided by curbs or level differences into areas for particular uses. Integrate Naked Street principles, such as minimal use of traffic signs, road markings and other traffic management features. This encourages automobile drivers to recognize the street ROW as different from a typical road, and to react by driving more slowly and responding directly to the behavior of other users, including other automobile drivers, rather than predominantly to the traffic management features. On level streets, address special needs of visually impaired people, children, people with restricted mobility, and people with learning difficulties to ensure that they are not put at increased risk. 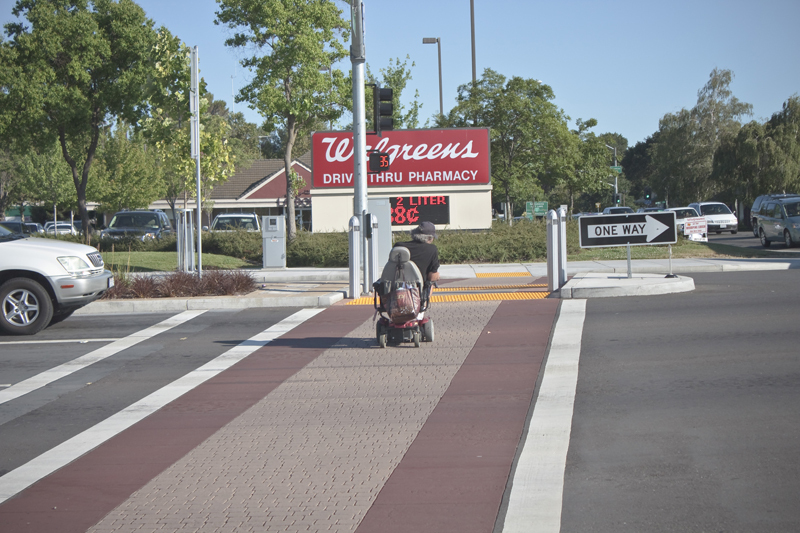 Always provide a minimum contiguous 5-foot wide ADA accessible path that has appropriate cues such as bollards, truncated domes, etc., at intersections. Reduce traffic management features that tend to encourage users of vehicles to assume priority. Provide universal access and well-designed pedestrian facilities to ensure not just a bare minimum level of safety, but also to provide a desirable environment that is comfortable, enriching and encourages people to prioritize walking as the primary mode of transportation. Ensure universal access for people of all abilities. 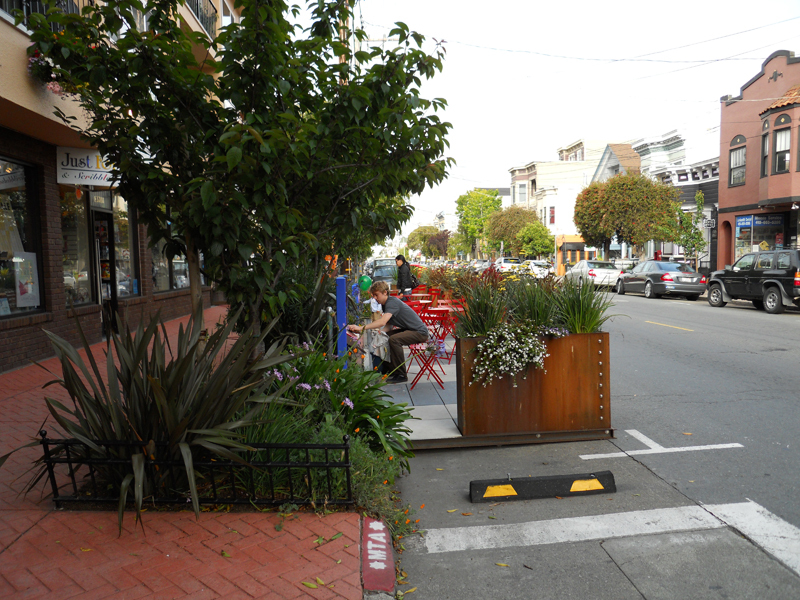 Provide a minimum 5-foot wide sidewalk on streets with a relatively low volume of foot traffic. 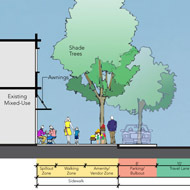 Provide a minimum 8-foot wide sidewalk on streets with relatively high volume of foot traffic. Provide sidewalk cross slope no greater than 2%. Create the right environment for pedestrians by providing amenities and protection from the elements, such as trees, shelters, adequate street lighting, etc. Ideally, uncontrolled crossing distances should be no more than 21 feet. Prioritize the safety of pedestrians at intersections. Do not allow double (or triple) left or right turns concurrent (permissive) with pedestrian crossings at signalized intersections. 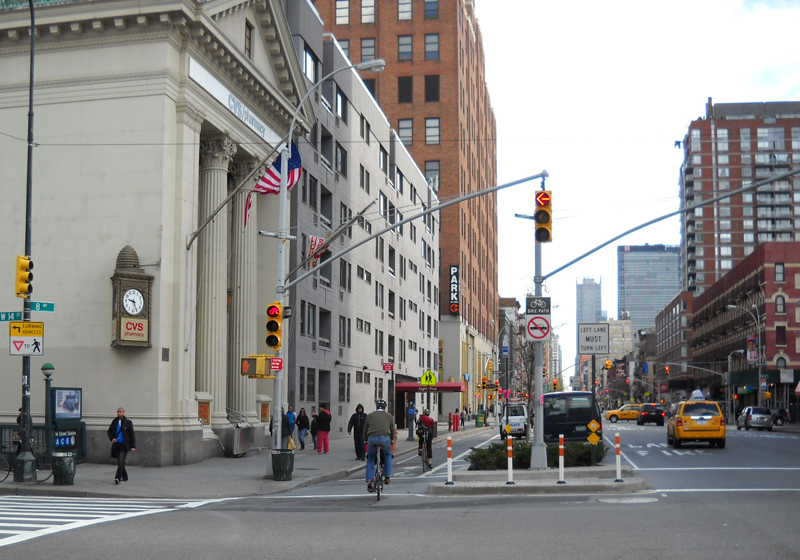 Pedestrians should never have to wait more than 90 seconds at signalized intersections. Provide and setback 12- to 24-inch wide advance yield/stop lines at signalized intersections 4 feet to 6 feet from the crosswalk. Provide well-designed bicycle facilities to ensure not just a bare minimum level of safety, but also provide a desirable environment that is comfortable, enriching and encourages people to prioritize biking as the primary mode of transportation. Ensure a system of designated bicycle facilities that offer enhancements and priority to bicyclists over other roadways in the network. Locate shared roadways on low traffic volume (not more than 3000 to 5000 vehicles per day) and low traffic speeds streets not exceeding 25 mph. Use markings such as sharrows to emphasize the shared roadway designation. Locate bicycle boulevards (enhanced shared roadway) on streets that need to prioritize through bicycle traffic but discourage through motor vehicle traffic. Locate shoulder bikeways on rural highways and county roads. Provide a 6-foot wide shoulder or a minimum of 4-foot wide. Locate bike lanes on roads where on-street bike facilities are needed and the traffic volumes are greater than 3000 to 5000 vehicles per day or traffic speeds are 30 mph. Provide a minimum bike lane width of 5 feet from the face of the curb, or 4 feet on open shoulders. If on-street parking is permitted, a minimum 6-foot bike lane should be placed between travel and parking lanes. 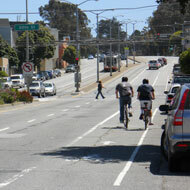 The width of bike lanes can be increased to 8 feet to mitigate higher speed and volumes of traffic. 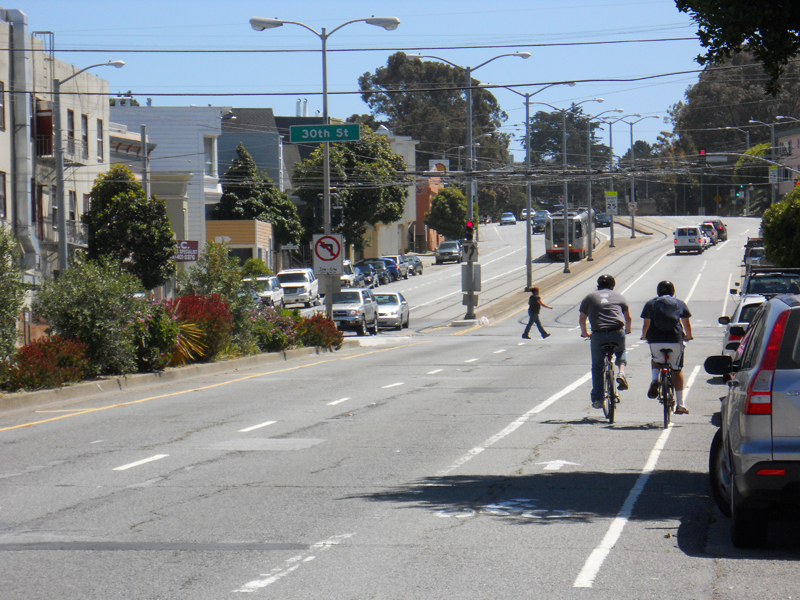 On lanes shared by buses and bicyclists, provide 13- to 15-foot wide shared lanes. 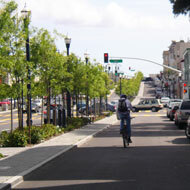 Locate cycle tracks or protected bike lanes in urban areas like downtowns where there is a need to minimize conflicts between traffic and pedestrians; there are minimal pedestrian crossings and driveways; there is minimal unloading and loading activity; and where there is surplus roadway within the right-of-way. The width of the cycle track should accommodate street sweeping or dedicated cycle track sweeping equipment should be acquired, and is generally 8 feet to 10 feet wide. Right-of-way for cycle tracks can be provided by narrowing travel lanes and reallocating space, thereby slowing traffic. Cycle tracks can also slow traffic turning speeds by not contributing to the available shoulder for auto turns. 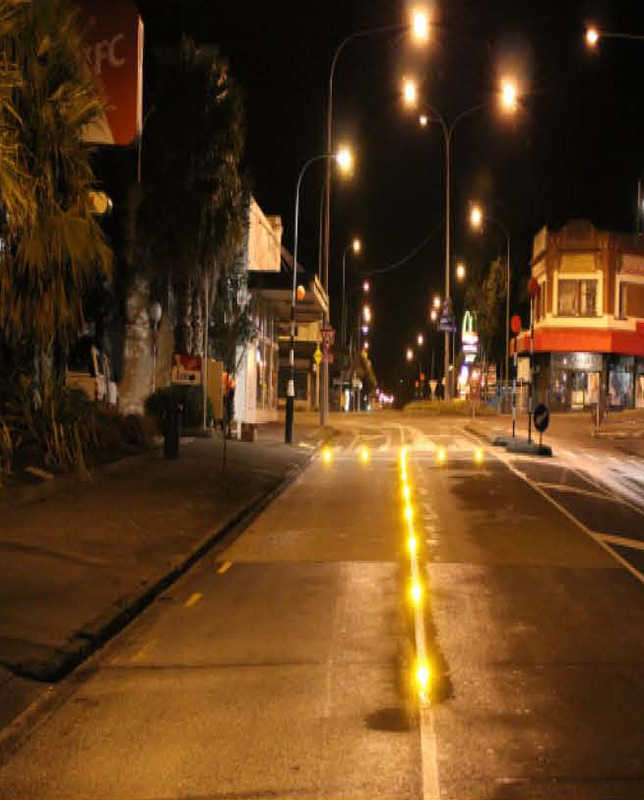 Locate buffered bike lanes on wide, busy streets, where physically separating bike lanes with cycle tracks is undesirable due to frequent pedestrian crossings, driveway or loading conflicts, cost, or operational or maintenance reasons. Slow traffic by narrowing the adjoining travel lanes, and provide a painted divider between bike lanes and travel lanes. 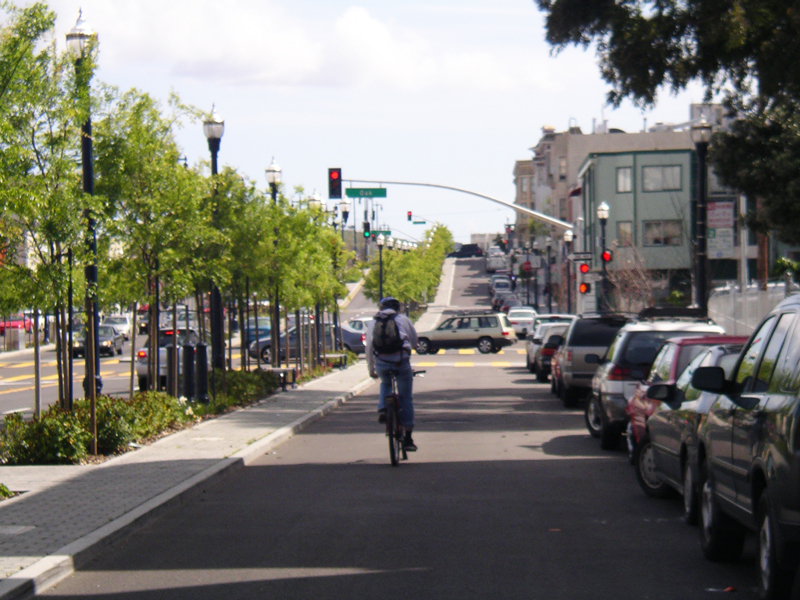 On constrained right-of-way streets without on-street parking where bike lanes are not possible, provide wide curb lanes 14 feet to 15 feet wide. Separate the space for cyclists by striping to discourage motorists from driving there and to reduce traffic speeds is preferred. 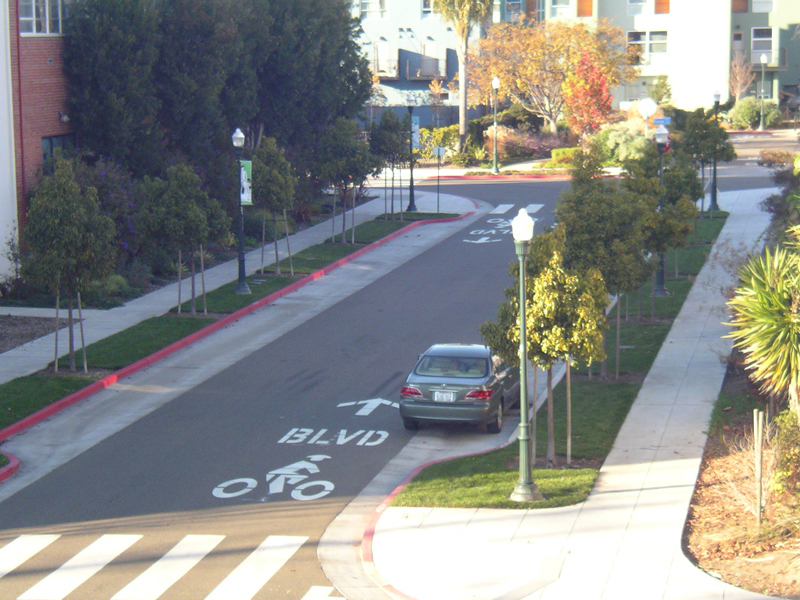 On constrained right-of-way streets with on-street parking where bike lanes are not possible, provide an 11- to 12-foot wide right lane and a shared-lane marking to indicate the position of the cyclist outside the car door zone. Provide approximately 12-foot wide shared use paths in areas where pedestrians and bicyclists need to share the path of travel. Design intersections with bicycle facilities to reduce conflicts between bicyclists and other users (vehicles and vulnerable road users) by heightening visibility, denoting a clear right-of-way, and ensuring that the various users are aware of each other. Continue marked bicycle facilities at intersections (up to crosswalk), and, where needed, place the bike lane pocket between the right turn lane and the rightmost through lane. 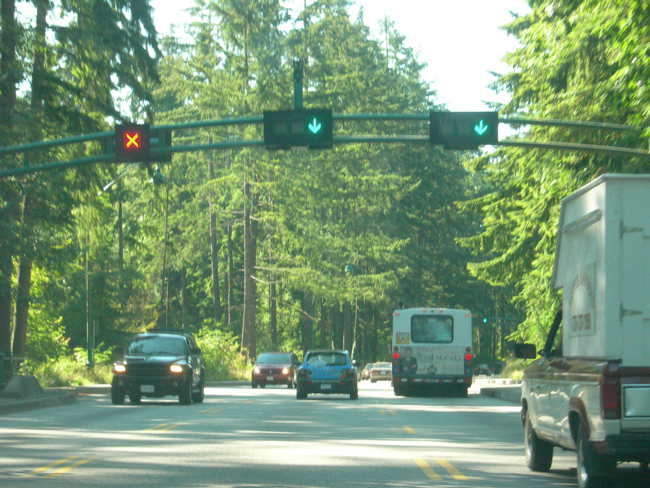 Incorporate bicycle detection and bicycle signal heads at signalized intersections. 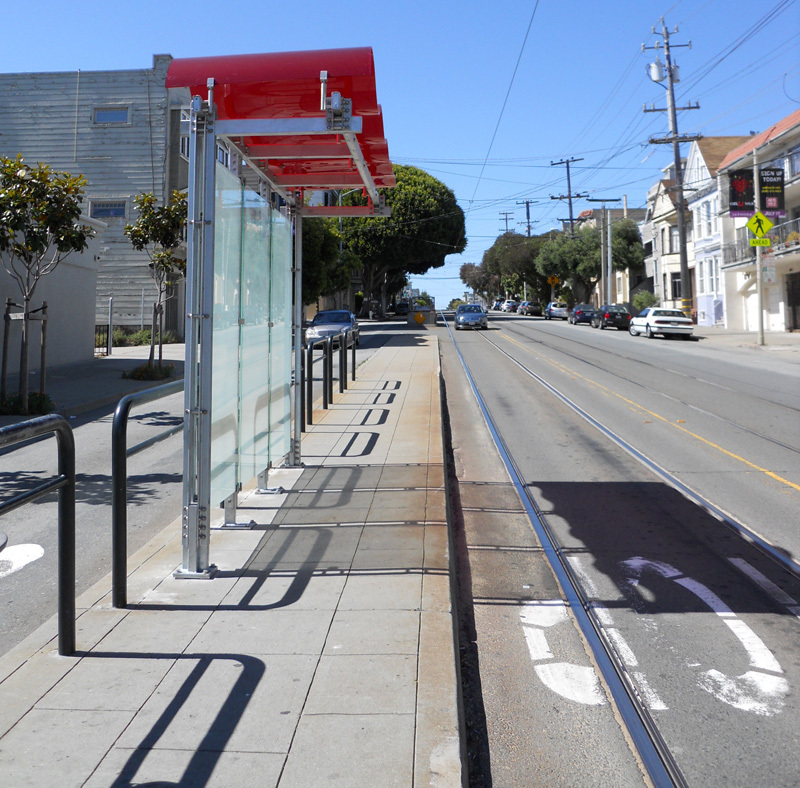 Locate bicycle parking at convenient locations including key destinations. Manage real-time traffic and travel demand by building on the experience of recent projects in European and American cities to manage the demand for automobile and truck travel. This strategy influences travelers before they get into cars (promoting non-motorized modes and alternative destinations of travel) and provides improved options for drivers who choose to use the road system (faster routes and more reliable travel times). Actively study and monitor the individual streets and the larger street network based on real-time conditions before coming up with specific solutions for traffic management and travel demand. Integrate real-time traffic management with travel demand management. On major through corridors, explore infrastructure changes such as flexible HOV lanes, HOT lanes, and expanded park and ride systems to modulate automobile use. Provide dynamic real-time pretrip traveler information systems to clearly encourage more efficient travel, suggesting routes and times of the day that are less congested and offer more reliable travel times. Pretrip information can also influence the mode selected (e.g., public transport or carpooling) or even the destination of travel (such as working from home or shoping closer to home). Provide dynamic near-trip information and even on-trip (en route) information to influence time, route, mode and destination choice. For example, commuters can be provided with real-time information on travel times to their work location if they continue to drive or if they shift to a nearby park-and-ride service. Strengthen and enhance real-time traffic management strategies, such as alternative routes and improved public transportation facilities to mitigate traffic during major construction projects and during large scale events. Strengthen and enhance traditional transportation demand management (TDM), such as rideshare matching, promotion of alternative modes and vanpool provisions. Explore road pricing schemes to modulate private automobile access to urban centers. Pricing should include incentives for changing modes or time of travel. Revenue from these schemes can be used to improve services, such as park and ride systems or public transportation (new routes, cleaner fleets and service frequency improvements). Revenue can also be used to aggressively encourage alternative modes through free or discounted public transportation passes, etc. Pricing should also take into account the benefits of reducing peak-period traffic, improving air quality, and encouraging walking and biking in the urban centers. Provide dynamic route information panels and variable speed control signs to communicate information on congestion, incidents and alternatives to slow traffic before drivers reach the queue. This has been successfully demonstrated to increase safety, improve efficiency and reduce delay. Integrate demand management into the long-range transportation plans and shorter range operating policies. Continuously and carefully monitor system performance by looking not only at mobility, but also at measures such as accessibility, air quality and livability. Utilize and incentivize various bike sharing programs. 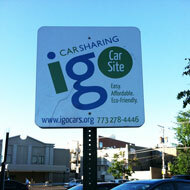 When needed, incentivize car sharing programs. Utilize proven design approaches such as reversible lanes to increase roadway capacity and passenger throughput, reduce congestion and manage system efficiency. Use reversible lanes to allow one or more lanes on a facility to shift direction throughout the day to accommodate traffic patterns, such as morning and evening peaks. 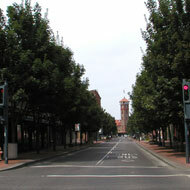 Locate reversible lanes where there is a large directional flow during peak periods in constrained street right-of-way. Provide lane control signs, and special pavement markings to inform motorists of lane direction and movements. Explore emerging technologies to improve traffic throughput capacity and to allow dynamic control over travel way lanes and vehicle pacing. Explore technologies such as inductive power on-road lights (SmartStuds) that allow lanes to be opened and closed during weekdays, weeknights and weekends. Use technology to balance the flow of traffic, pace vehicles and reduce speed of traffic. Design streets to be flexible to accommodate changes (size, turning radius, propulsion, etc) in the existing modes of travel (automobile, public transit vehicles, bicycles, etc.). 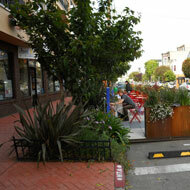 Explore level streets with flexible barriers such as bollards, planting strips, etc. to demarcate the curb zone instead of the traditional curb. This will allow for easier transition and redesign of the travelled way and intersection. Locate areas for charging of future electric vehicles, including existing electric cars and the electric bus rapid transit (e-BRT) vehicles currently being developed. Use on-street parking strategies to better utilize parking lane. Utilize advance parking systems to guide drivers in congested areas to the nearest parking facility with empty parking spaces via cellphone, smartphone or GPS navigation device. 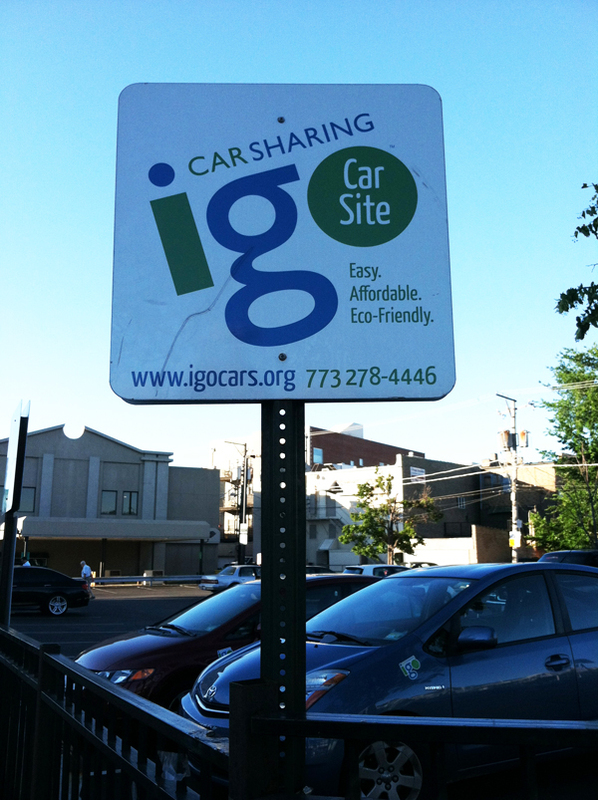 This reduces congestion, illegally parked cars, and time and fuel otherwise wasted while searching for empty spaces. Encourage payment of parking via cellphone/smartphone, including initial payment and subsequent additional time. This can help save money by paying only for the time actually parked and allows the parker to receive text message reminders, resulting in less chance of receiving a citation. Create a variable rate parking policy, pricing parking so as to create some available spaces most of the time and increasing parking availability and turnover. Survey the average occupancy at least annually and no more frequently than quarterly. 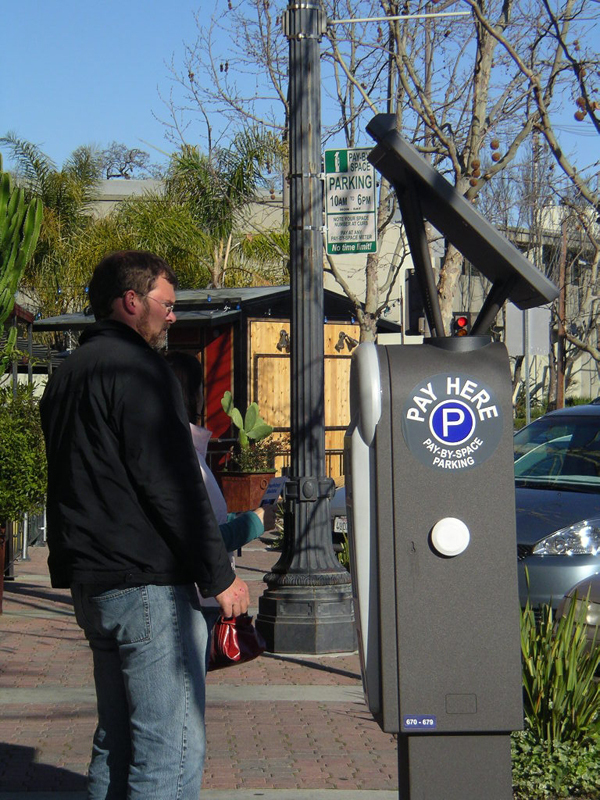 Adjust the metered parking rates up or down in $0.25 intervals in order to achieve the target occupancy rate. Actively involve the adjoining merchants and property owners in the development and maintenance of the new parking occupancy policy. Locate on-street parking to help reduce travel speeds. Allocate enhanced curbside parking fees to renovate or enhance the blocks where parking is located through business improvement districts. Parking can be a source of revenue for government, and if priced correctly, can fund other city priorities. Provide appropriate ADA parking spaces. 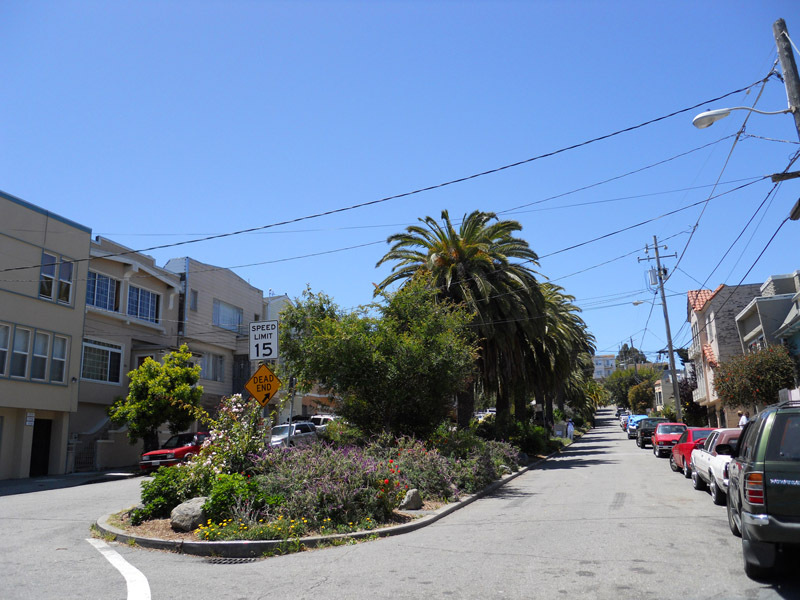 Explore angled parking where there is a need to maximize on-street parking. Provide back-in diagonal parking on roads with on-street bike lanes. Maximize low-cost, high-impact solutions, especially when budget is constrained. Explore relatively low-cost solutions, such as lane restriping or restriping to create bike lanes or narrower lane widths. 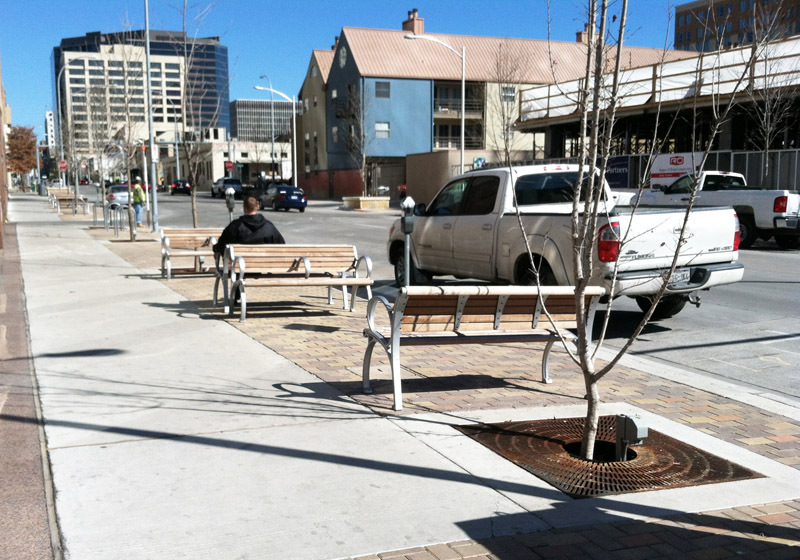 Require local businesses to contribute to the cost of certain streetscape improvements, such as trees, shrubs, seating, etc. 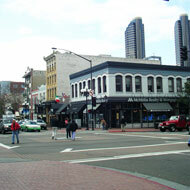 To the greatest extent possible, include streetscape improvements in the regular maintenance of streets, such as street reconstruction, repaving, etc. 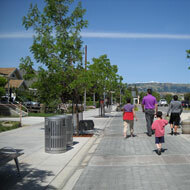 Encourage public and community participation in designing streetscape improvements. 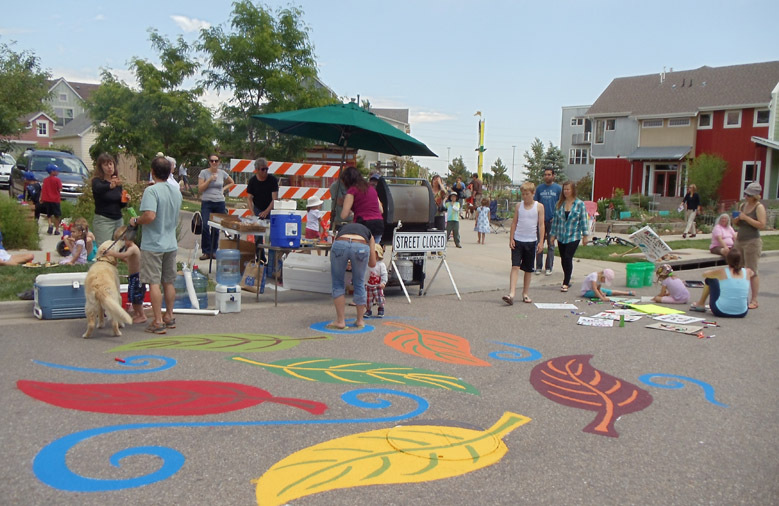 Involve the community early on in the overall planning and design of streets through various forums and media, such as community meetings, design charrettes, websites, blogs, etc. Build partnerships with residents and businesses so that they can learn about the benefits of streetscape improvements. 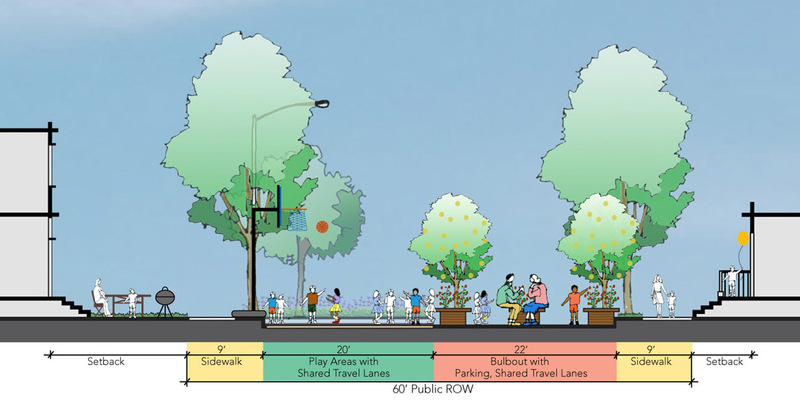 For relatively new concepts, such as back-in parking and roundabouts, incorporate a strong educational component both in the early planning of the street as well as during project implementation. If needed, create an interim temporary situation on the site so that people can experience the new concept before it is finalized. 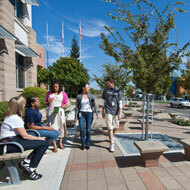 Build community pride and ownership in the construction and maintenance of the new streetscape improvements. 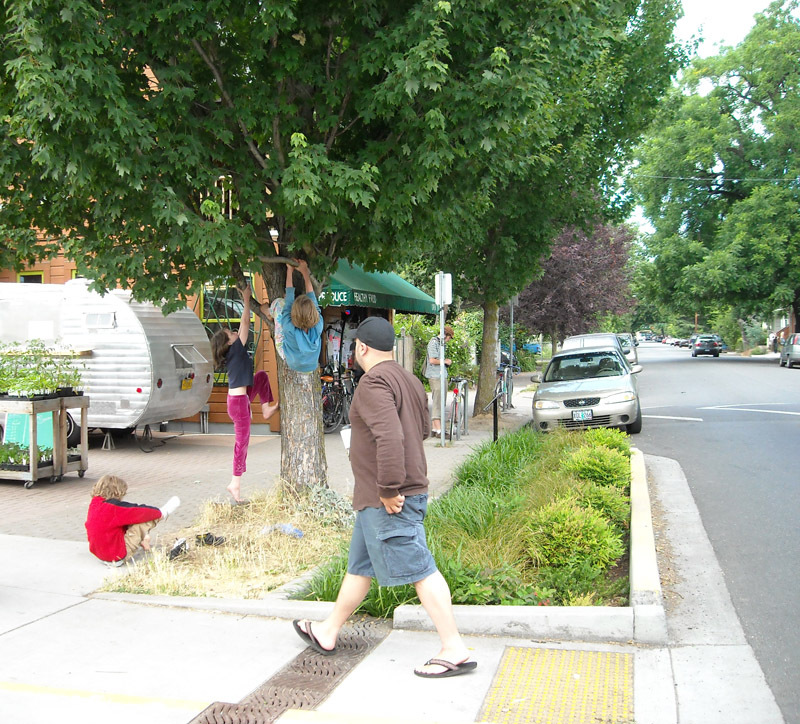 Actively engage the community in the creation of certain streetscape improvements, such as trees in sidewalks, landscaped medians, etc. For long term maintenance, create a volunteer program consisting of individual community members, local organizations and community groups. Identity a primary volunteer coordinator who can regularly interact with the city or county agency responsible for streetscape improvements. Ensure the reliability and accuracy of wayfinding content. 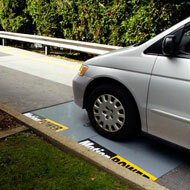 Provide test periods for temporary signage elements before permanent systems are installed. 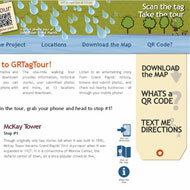 Provide a way to collect real-time user feedback on wayfinding and interpretive features using mobile technology apps. As part of the scheduled maintenance of wayfinding elements, identify content that is missing, obscured, out-of-date or presents navigational conflicts. In situations where information conveyed changes relatively often, use dynamic wayfinding elements or equivalent QR (quick response) code technology. Design attractive and user-friendly wayfinding elements for people of all ages and abilities regardless of mode choice. Select materials and surfaces to create durable, low-glare, high-contrast and vandal-proof wayfinding elements. Ensure that the placement height, distance, orientation, approach and print-size of wayfinding materials are accessible for intended users. Provide appropriate non-English translation of wayfinding elements and/or provide access to translated content. Use internationally recognizable symbols in wayfinding elements. Develop smart technology applications that can provide equivalent translation of wayfinding features into other languages. Develop individual wayfinding components that work together to add successive layers of knowledge to a place, destination or other feature in the landscape. Along historic streets, integrate historic video footage in wayfinding features that illustrate the character of activated streetscapes from past eras. Provide period tactile features, such as period-specific paving or lighting. Along industrial or manufacturing districts, locate places where there is a predominant smell, sound or sensation created that can be linked to interpretive signage features. Design wayfinding features that employ the use of all five senses: taste, touch, sight, smell and hearing. Develop a comprehensive and integrated signage system with primary information in tactile, olfactory or audio form, supplemented as needed with written and visual elements. For streets that are food and dining-focused destinations (Gourmet Ghetto, Little Italy, etc.) develop wayfinding features and interpretive signage that capitalize on the availability of pleasing, attractive smells that are natural people magnets. Use planting techniques to capitalize on continuous fragrant blooms and scents of trees, herbs and flowers. These elements can be used sparingly to denote key nodes or more profusely and regularly along the sidewalk of important streets. Use different types of scented landscape elements to distinguish different streets or nodes. Where possible, in hot dry climates, incorporate misters, spray elements, etc. Use materials that respond distinctly to weather variations, such as rain on soil. 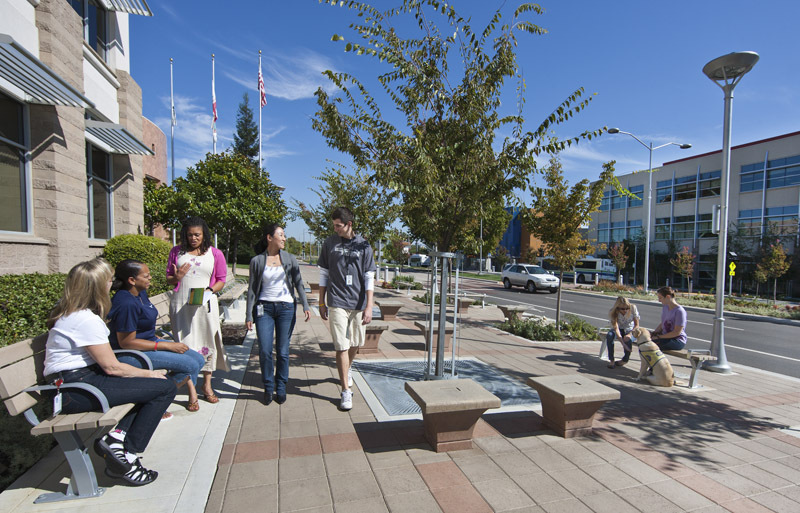 Use accessible textured paving materials such as decomposed granite, treated wood, stone pavers, etc., that contrast with the common ADA compliant surfaces to delineate special areas within a street environment and provide cues to visually impaired people. In dense urban environments, explore the change in microclimates and temperature differences to heighten and celebrate key nodes and intersections. Certain nodes or streets can be designed to be sunny and warm or cool and shaded. 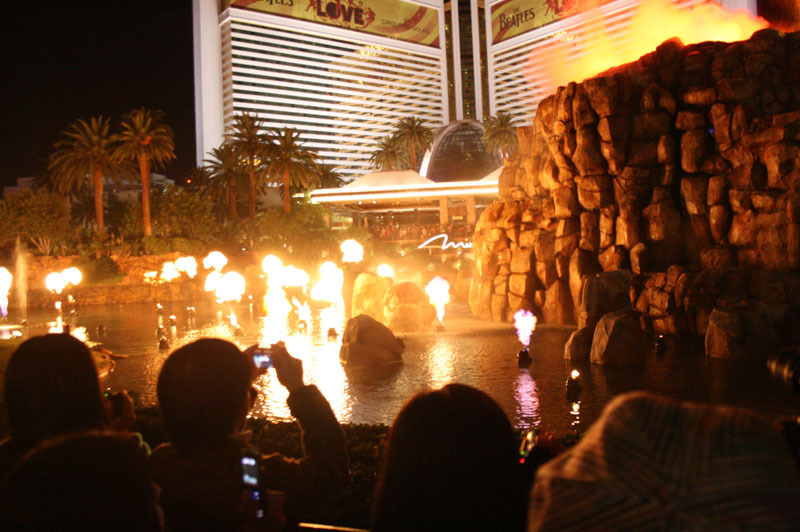 Locate fountains and other water features with an audio element to strengthen a landmark node. In windy climates, use wind elements, such as wind chimes and other wind-activated instruments, as part of street furniture, such as street lights, to create southing sounds. Use sculptural elements that capture the wind to denote and celebrate key destinations. Use iconic elements, such as electric or steam power clock towers that use steam and audio elements to celebrate the history of the neighborhood as well as denote primary gathering areas. 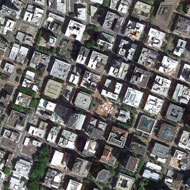 (Example: Gastown, Vancouver). Use emerging talking-sign technology for both private mobile devices and use at individual destinations. 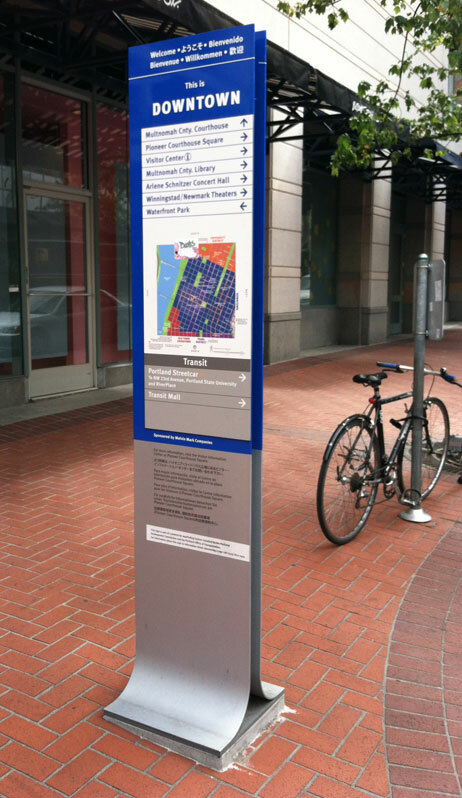 Eliminate ambiguous, confusing and redundant wayfinding elements that can clutter a street. 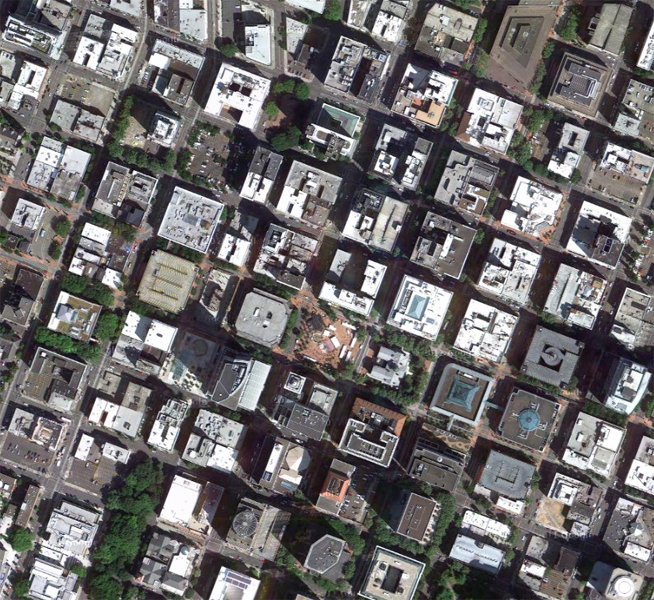 Use plans and maps with a heads-up rather than north-up orientation that simulates on-the-ground user experience. Go through a prioritization process to limit the number of wayfinding features and the amount of content permitted per feature. Identify features that are best replaced with mobile technology applications. Develop sign codes that encourage private realm signage to complement rather than compete with public wayfinding. Use a minimalist approach to wayfinding around urban corridors with significant views to let the destination speak for itself. 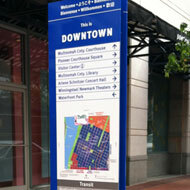 Develop design, color and style palettes for wayfinding elements that are locally meaningful and universally appealing. Where appropriate, develop branded logos or icons that reference widely recognized features of the area. Use branded logos and icons to help further define the shape, scale and dimensions of wayfinding hardware. Choose colors and typeface for wayfinding elements to reflect the physical and cultural context to strengthen links and connections between areas. Ensure the compatibility of print logos and color palettes with print media and mobile technology applications. 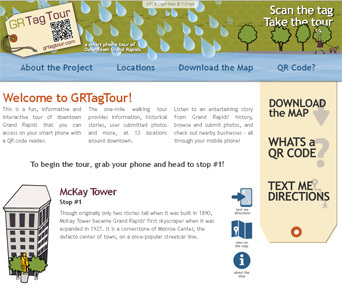 Develop social media wayfinding applications for smart devices. Design district or street scavenger hunt applications that work for small, providing rewards along the route and encouraging urban stewardship. Utilize geo-coded QR (quick-response) code technologies and smartphone applications to direct people to information they need to make educated decisions. Develop apps that address needs of underrepresented user groups, such as youth, seniors, non-English speakers or minorities. 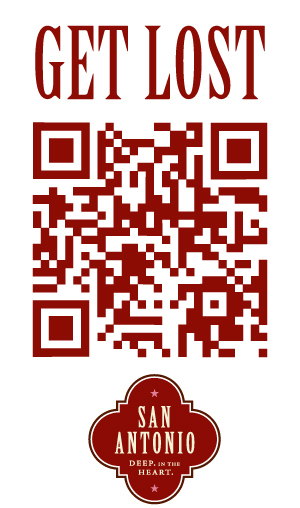 To reinforce branding recognition of destination streets, customize the visual design, color and pattern of QR codes (Example: San Antonio’s “Get Lost” QR code). Develop strategies to bridge the gap between digital and traditional wayfinding elements. Create step-by-step guides that assist novice users of smart technologies to download apps and launch them on personal devices. 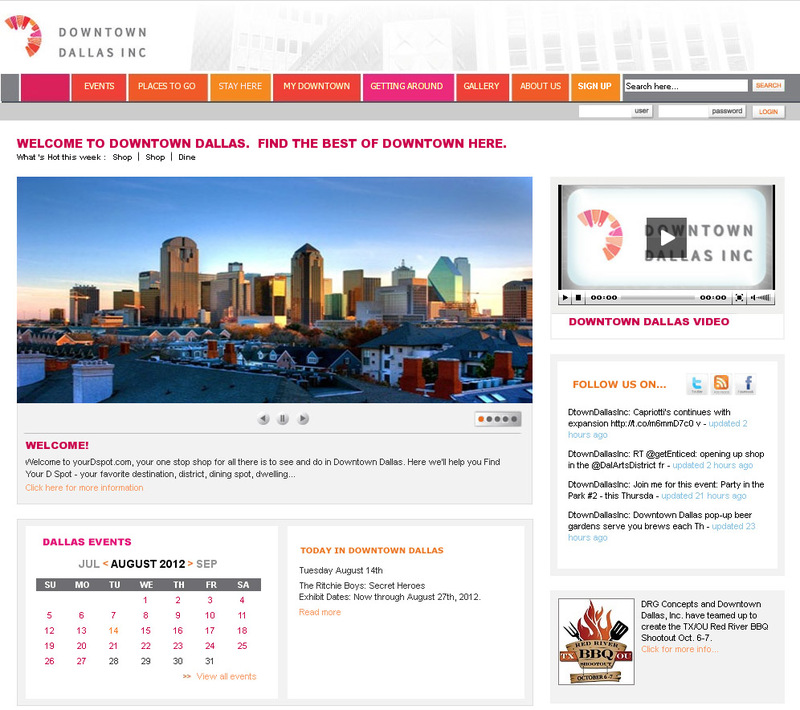 Develop a social media presence for streets that advise people of upcoming events, exhibits or attractions – advertise using print, digital, radio, etc. Ensure that commercial spaces accommodate comfort and convenience for both customers and business owners. Ensure all commerce areas provide protection from the elements, including sun, wind and precipitation. Provide ample shade trees, but also provide awnings or other overhead elements to protect against precipitation. Limit vehicular speed to 25 mph or less. 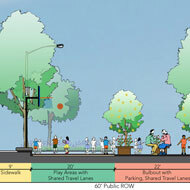 Design for lower target speeds for shared-use streets. 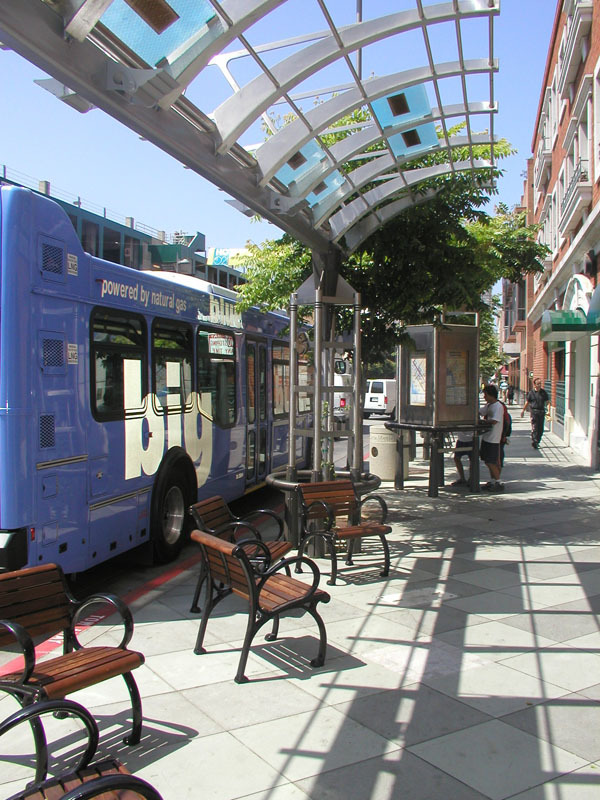 Provide transit stops at least every ¼ mile, and include shelter and seating for waiting passengers. Vary spacing between stops as appropriate. Maintain sight lines and clear visual paths to encourage strolling and self-discovery. 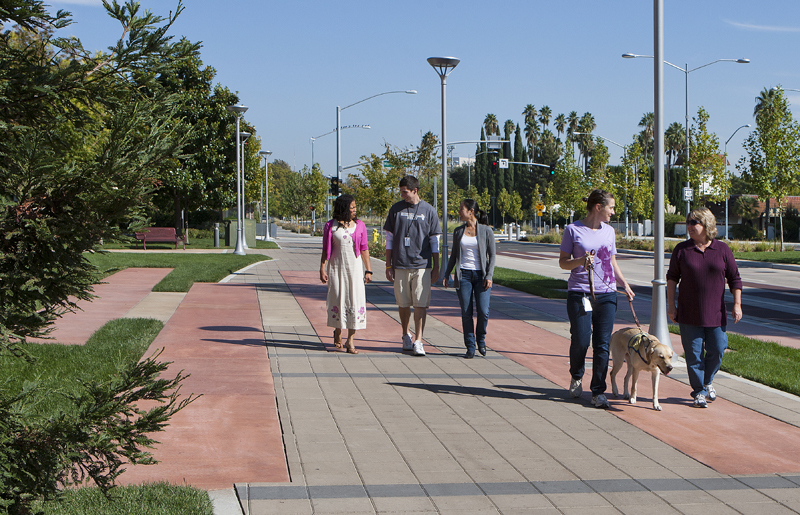 Design pedestrian-friendly commercial spaces for people of all ages and physical abilities. 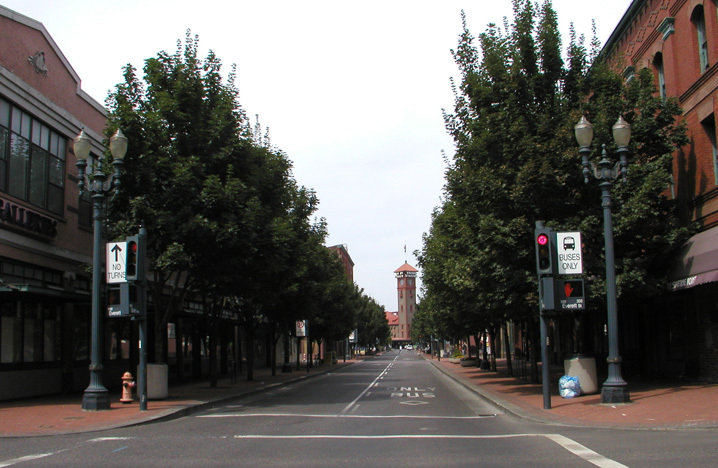 To ensure the street has an overarching pedestrian scale and character, maintain a maximum of two vehicle travel lanes in each direction, with each lane being a maximum of 10 feet wide. Ensure that all pedestrian travel surfaces are firm, stable, and slip-resistant. Avoid incorporating any areas that are not accessible to people with disabilities. Make sure that there is a minimum 5-foot wide travel way for pedestrians, clear of any obstructions. Provide 8 feet minimum where possible. Ensure any signs, shade elements (such as umbrellas or trees), or other features are high enough to pose no hazard (80 inches or higher). Avoid any protrusions into pedestrian travel ways that are higher than 27 inches, so that protrusions can be detected by someone with a visual impairment. Where seating is provided, incorporate a variety of seating to accommodate a range of physical abilities, as well as companion seating that enables wheelchair users to sit next to friends or family members. Ensure that any vendor carts, trucks, or kiosks provide menus or commerce-related signs and ATM or credit card readers at a height that is accessible to a range of people, including children, people of smaller stature, or those with less than perfect vision. Ensure that vendors are aware of their responsibility to make accommodations for people with disabilities, such as by exiting the cart or truck to deliver food or make change. Design and orient buildings to help define outdoor commercial activities through attractive edges, interesting windows and exhibits, and local character. Develop style, color, and material design guidelines that are attractive, locally meaningful and universally appealing. 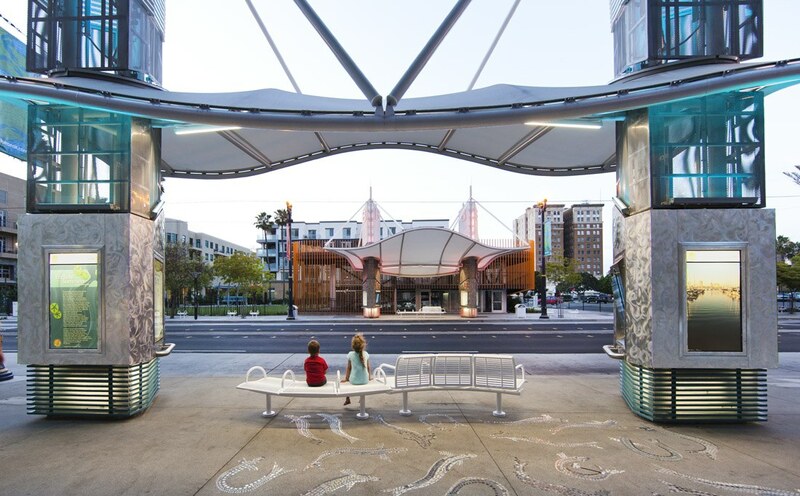 Where possible, integrate art as part of functional features—benches, lighting, walls, kiosks, space dividers, planters, and shade structures can all be works of art. Incorporate a distinctive furnishing and planting palette that reflects the desired street character and image, and is visually attractive year-round. Carefully locate site furnishings so that they function effectively, but avoid a cluttered look. 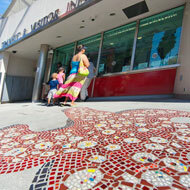 Provide signature elements, such as murals, sculpture or site furnishings, that reflect local history and culture. 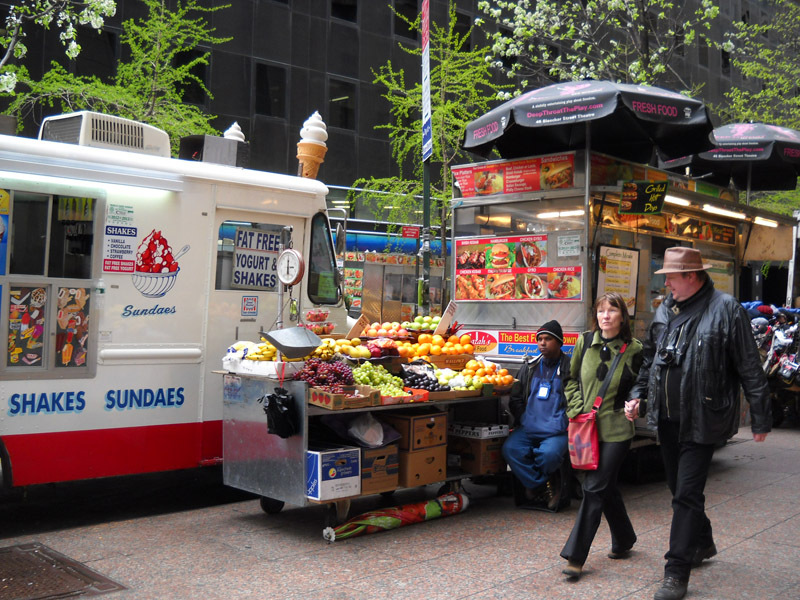 Ensure that street commerce areas are designed to balance initial investment and long-term maintenance costs. Use durable materials that show minimal wear with repeated and heavy use, such as concrete and stone. Emphasize finishes that require minimal maintenance. Consider the use of structural soil or other newer technologies to provide a suitable environment for healthy tree root growth and to minimize damage to adjacent paving. Encourage stand-alone and temporary or mobile commerce by providing flexible use zones in the right-of-way. 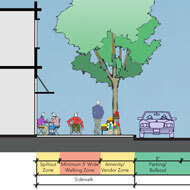 Establish a flexible use zone between the necessary travel lane and pedestrian path. Use materials or color to both distinguish the use zone from the vehicular travel way and connect it to the pedestrian area. 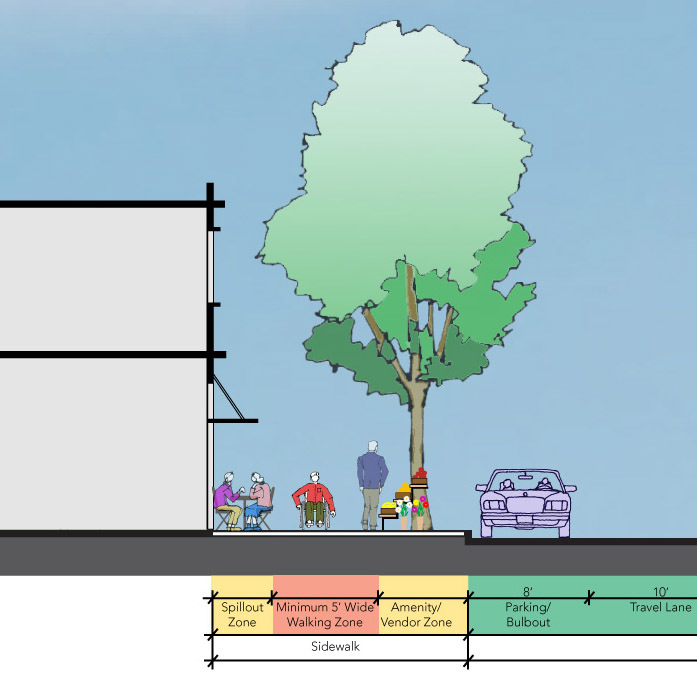 These zones could include the parking lane, adjoining travel lane that is potentially closed during off-peak periods, and a wide and generous median in shared-use streets. 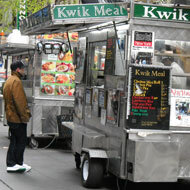 Ensure the flexible use zone can accommodate the size of a typical food truck or vendor cart as well as a variety of “two-top” dining tables with chairs - usually about 6 feet wide or greater. 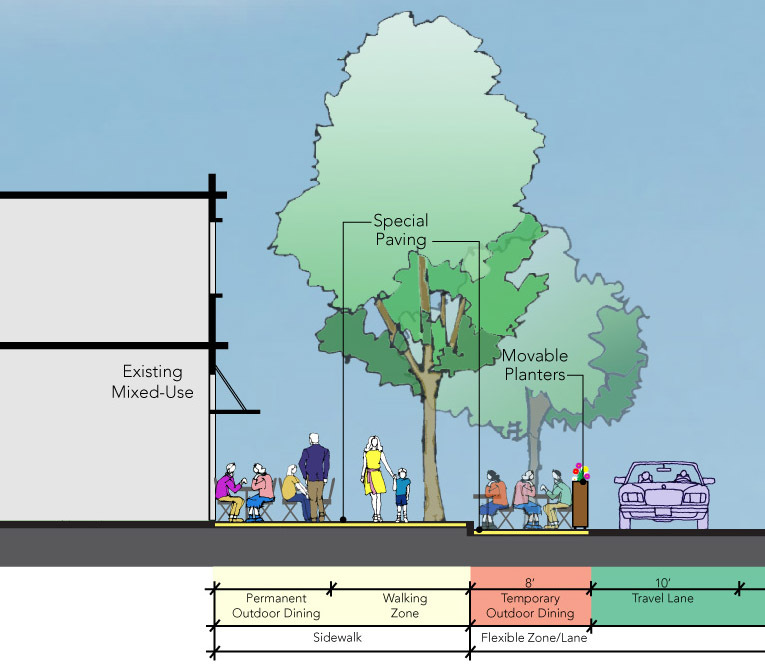 Where flexible use zones are used for outdoor dining, provide an attractive barrier between the vehicular travel lanes and the pedestrian walkway. 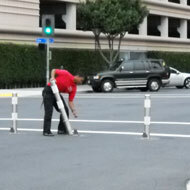 Barriers should be a minimum of 18 inches wide and from 3 feet to a maximum 4 feet tall. Consider using moveable planters or other sculptural elements as barriers. 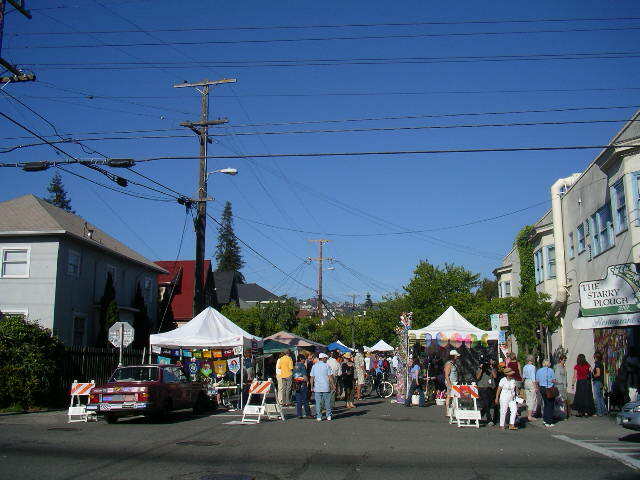 Encourage street festivals or farmers’ markets that temporarily utilize the parking lane or vehicular way as a commerce zone. Use the flexible zone to create one to two larger plazas, minimum 20 feet by 30 feet to allow performances, smaller festivals or vendor cart areas. 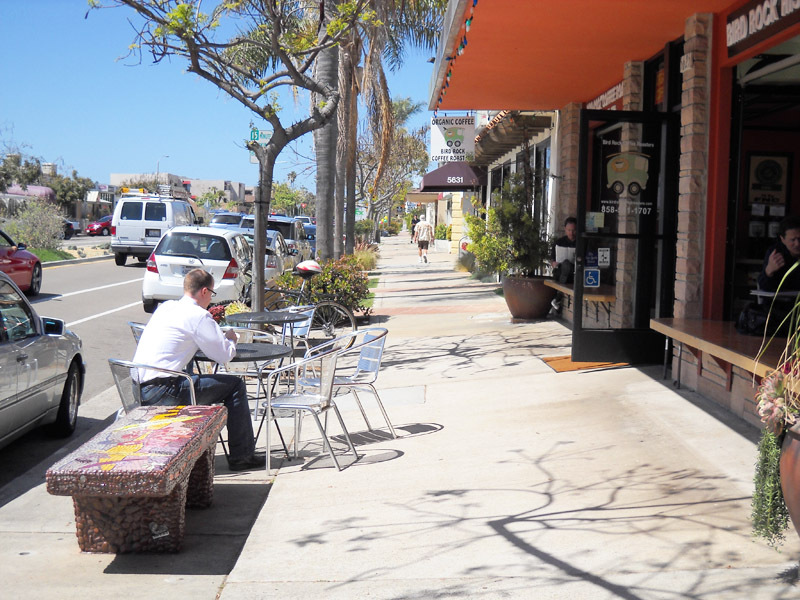 Maintain a number of on-street parking spaces in the flexible lane to support adjoining businesses and calm traffic. Encourage inclusion of temporary market areas. Encourage stand-alone, permanent commerce on the street by providing attractive, lockable kiosks, stands or other permanent sales locations. 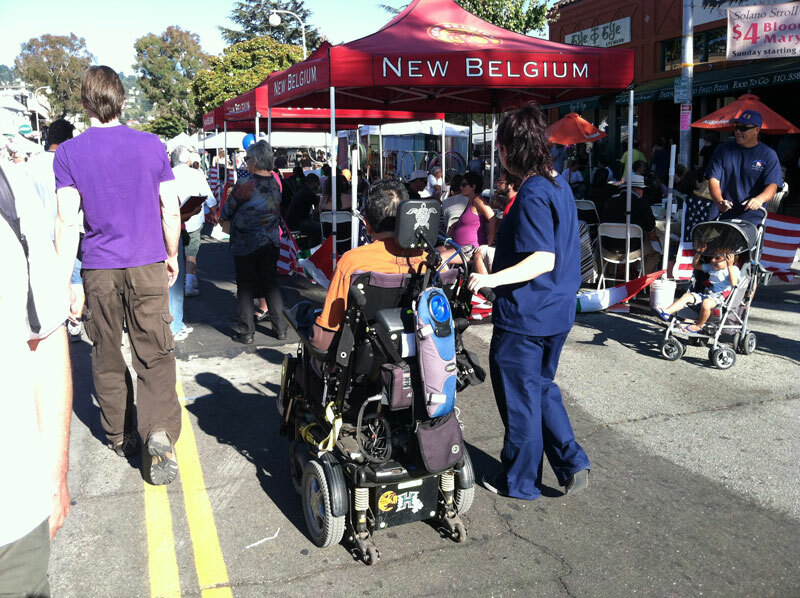 Ensure a continuous 5- to 8-foot wide ADA compliant pedestrian access along the sidewalk. Position kiosks or stands to avoid blocking the view of traditional commerce areas, such as market halls or retail spaces. 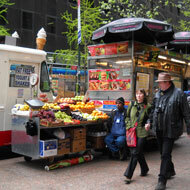 Where new buildings are to be constructed, consider incorporating exterior nooks to accommodate small vendors. Ensure that any doors provide an attractive street presence even when businesses are closed. Look for unusual or innovative forms or locations for these kiosks. For example, consider the French bouquinistes, which are mounted on top of walls at about eye-level. When they are open, the seller’s goods are easy to peruse. 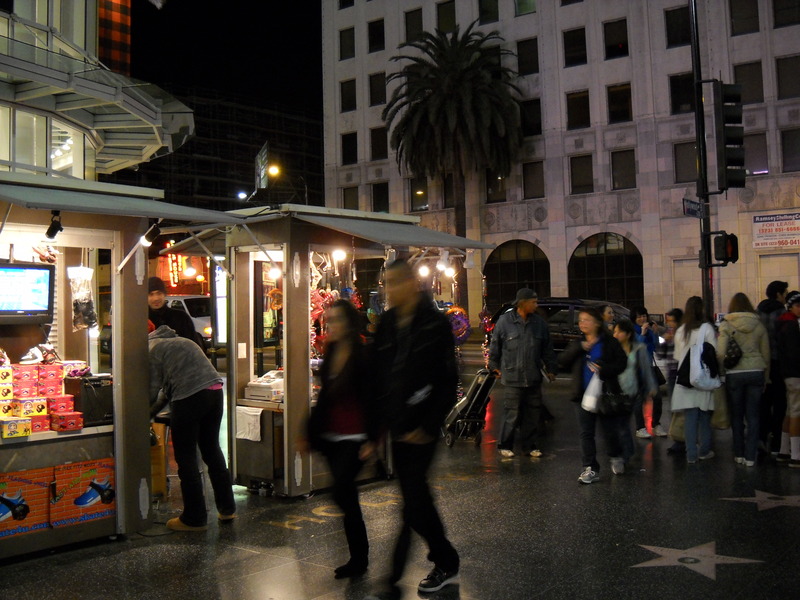 Depending on the space available, establish a range of standard kiosk sizes that could range from about 3 feet by 5 feet to 8 feet by 10 feet, and still ensure ADA compliant access. Facilitate all types of commerce in the public right-of-way by providing the necessary supporting physical infrastructure. Incorporate infrastructure like electrical outlets, water sources, grease drains, etc., into the street, and provide quick hook-ups for mobile businesses. Allow loading and unloading of commercial-related vehicles to occur in the parking lane during designated off-peak hours. Limit vehicular speeds in commercial districts to 25 mph or lower. Develop an overall branding and advertising campaign for each street or neighborhood to ensure that all commerce types have opportunities to promote their services and wares. Develop an attractive brand for the street or neighborhood, giving potential customers a sense of the street character as well as the available goods or services. Incorporate the street or neighborhood brand and character into gateway and street signs. Provide a web page for the street or neighborhood, including the opportunity for small entrepreneurs to either have an individual page attached to the website or a link to their own website. Maximize mobile media such as twitter to advertise existing and new locations of mobile carts. Encourage establishment of business improvement districts (BID’s) to strengthen safety, maintenance, marketing and programming activities. Establish maintenance practices to ensure commerce areas remain attractive to customers. 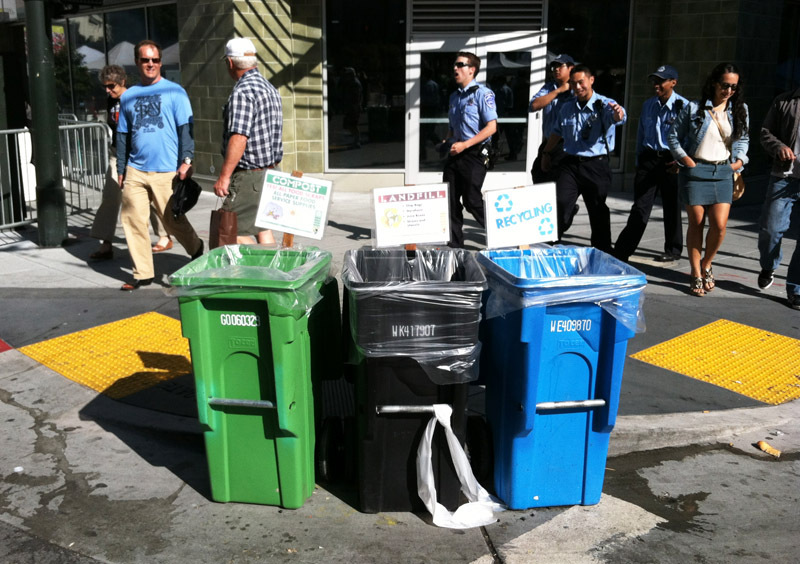 Ensure flexible use zones and pedestrian travel ways are kept clean and free of trash or debris. 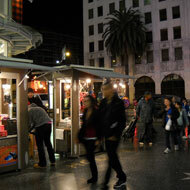 Require all food vendors to keep the area within 25 feet of their space clean and litter- and garbage-free. Ensure all tables, benches and other sitting areas are cleaned regularly and are therefore attractive to users. Implement business improvement districts (see 8e). Implement regulatory policies and procedures that encourages businesses of all sizes and types. 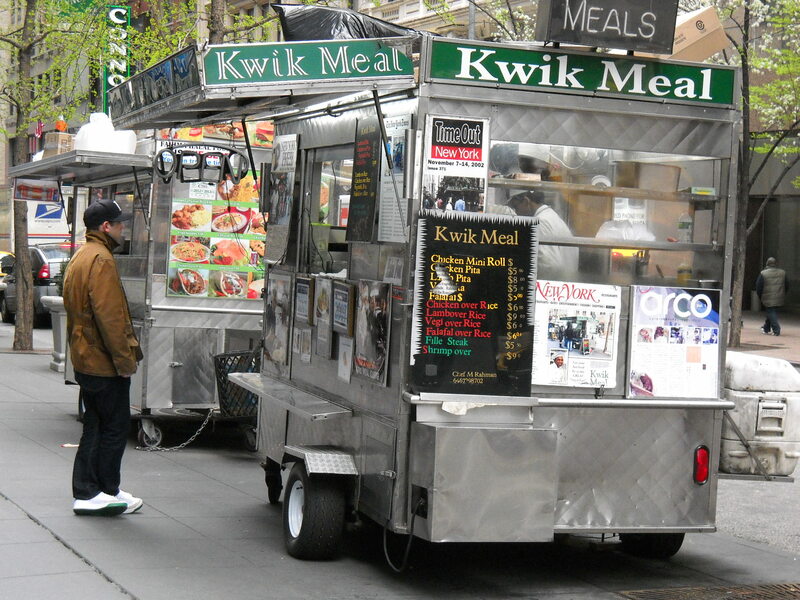 Allow food cart vendors to maintain a mobile business classification, while also providing them with consistent locations from which to operate so that customers can find them easily. Provide vendors with technical assistance regarding permitting and utility connections to help ease the start-up process. Implement convenient permit process review and affordable permit fees to encourage potential local and small-scale businesses. Provide easy-to-follow waste disposal, water use and water treatment regulations. Allow commercial uses beyond retail sales, such as workshops, catering kitchens, light industry, commercial services, as well as social services, such as childcare, immigration/legal advice or counseling. Provide gathering areas for people of all age groups and physical abilities. Provide a diversity of settings to accommodate groups of various sizes. 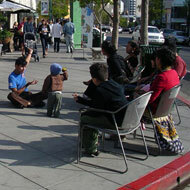 Provide space for a diversity of social activities that appeal to various ages: adults, teens and children. Ensure that all pedestrian travel surfaces are firm, stable and slip-resistant. Provide accessible pathways to amenities. Where seating is provided, incorporate a variety of seating to accommodate a range of physical abilities, as well as companion seating that enables wheelchair users to sit next to friends or family members. Ensure permanent ADA accessible seating every ¼ mile. Make sure that there is a minimum 5-foot wide travel way for pedestrians that is clear of any obstructions. Ensure any signs, shade elements (such as umbrellas or trees), or other features are high enough (80 inches or higher) to pose no hazard. Avoid any protrusions into pedestrian travel ways that are higher than 27 inches so that protrusions can be detected by someone with a visual impairment. Ensure that the areas where social gathering happens has an optimum level of safety, comfort and convenience. Provide moveable seating that allows people to create their own outdoor living rooms. Provide comfort that responds to climatic context and provides shelter from all elements including wind and rain. For example, provide trees and other shade structures, such as awnings, to provide shelter from the hot sun. 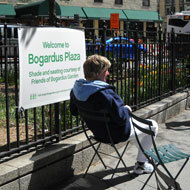 Provide seating areas for gathering at already active places, such as bus stops. 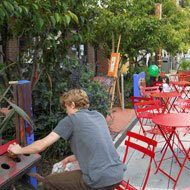 Provide quiet places to gather, such as street gardens with plantings and benches setback from the street. Provide gathering areas that feel safe and secure by maintaining clear sight lines and incorporating other crime prevention through environmental design (CPTED) principles. 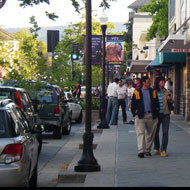 Implement street-calming features to reduce traffic speed to help create the right environment for social gathering. Lower the speed limit for traffic to no more than 25 mph. Encourage speed limits of 20 mph or less to minimize impacts of traffic on the social character of the street. Limit and control the types of vehicles on the street, e.g., manage truck traffic and control deliveries and service vehicles through restrictions on location and time of use. 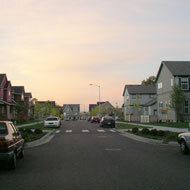 Use street-calming elements, such as trees, bulbouts, etc. Use varied paving materials or colors in parts of the roadway, such as the parking lane, to extend the pedestrian-friendly character of the street. Increase useable public space for pedestrians. Implement flexible travel lanes that can be used differently during certain times of the day or week, such as using a parking lane as a farmers’ market location one day a week. Reduce the number and width of travel lanes to provide more space for non-automobile usage of the street. 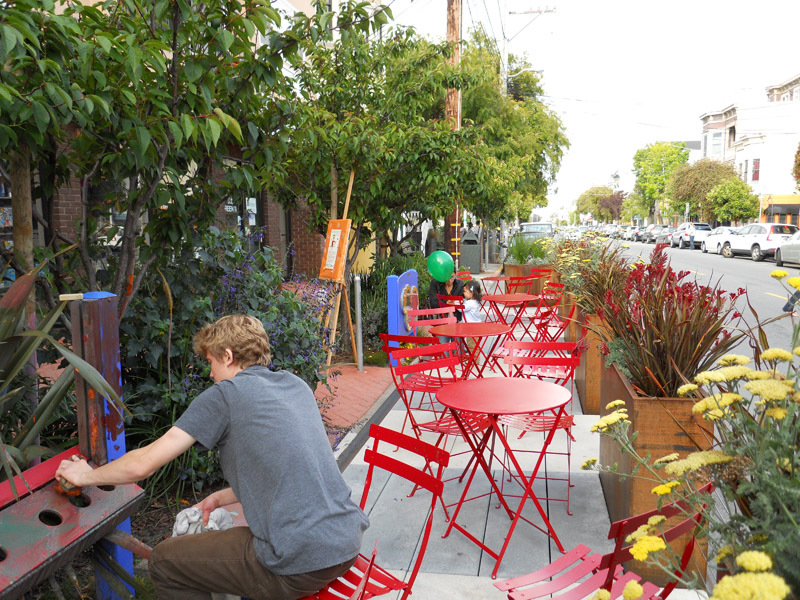 Convert parking spaces to other uses, such as outdoor seating, bike parking, etc. If needed, develop and implement a program for closing streets temporarily or permanently. 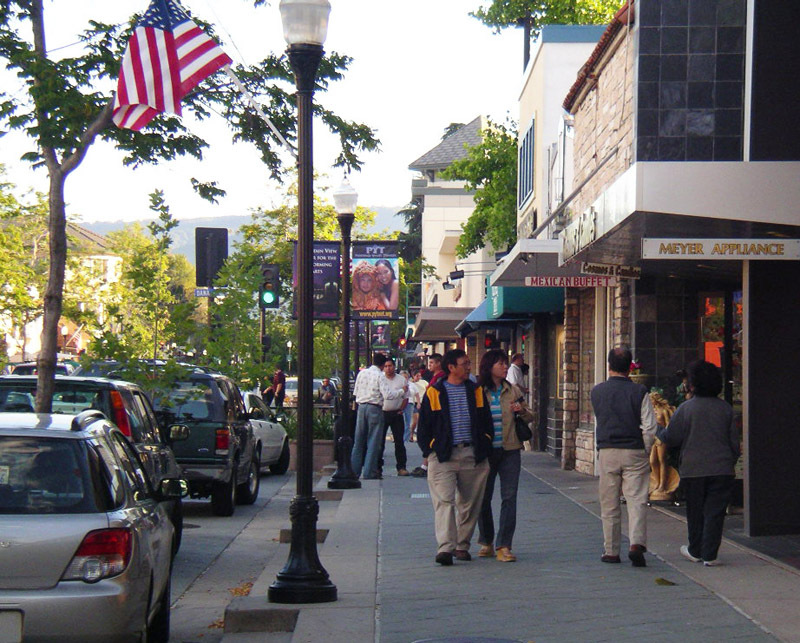 Ensure that the negative impacts of street closures, such as loss of street or neighborhood connectivity are appropriately balanced by the benefits of creating large, desirable and well-used social spaces. Implement temporary closing of streets to car traffic using removable bollards, removable posts for temporary fencing, etc. 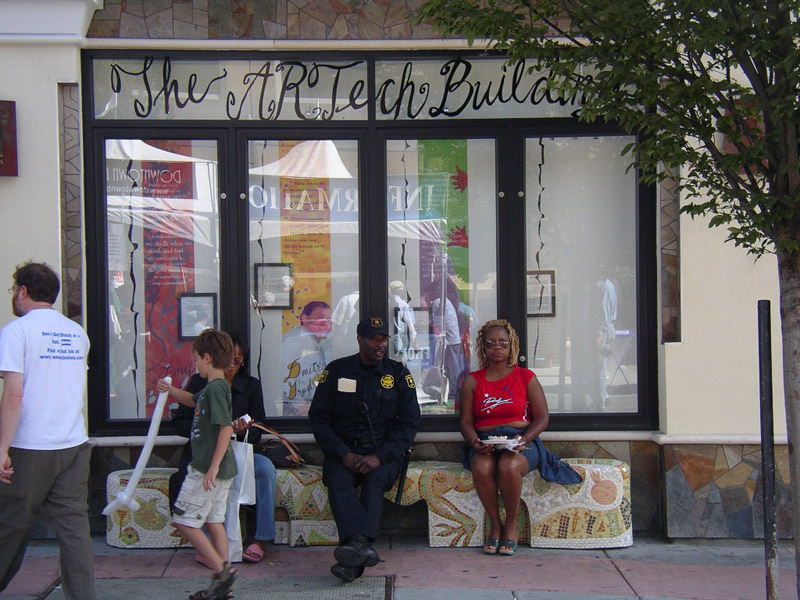 Use art to create community destinations that promote community pride and ownership. 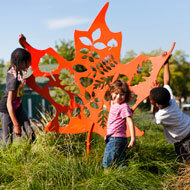 Install interpretive art that celebrates community life and highlights local history or ecology. Provide a distinct focal point, such as a large sculpture, water feature, etc., that provides an identity for the place or neighborhood. 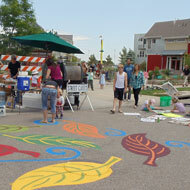 Organize collaborative art events, such as mural painting, etc., that allows the community to participate. 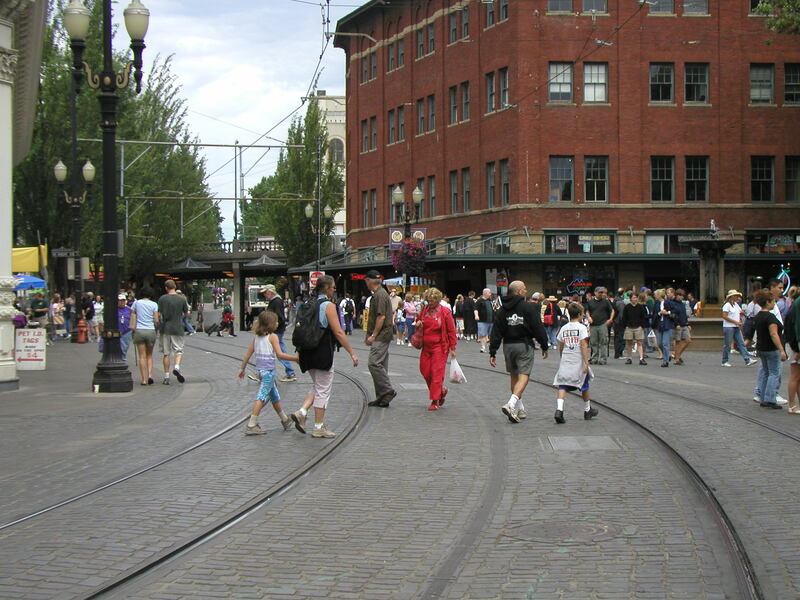 Create streets that have a strong pedestrian scale and character. 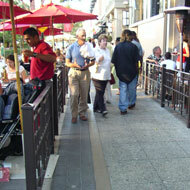 Provide wide sidewalks that allow pedestrian movement and gathering to happen simultaneously. 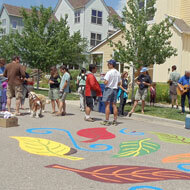 Explore creating flush or level streets without curb and gutter to create a seamless space for larger gatherings. Maintain a maximum of two vehicle travel lanes--one in each direction--with a maximum width of 10 feet per lane. 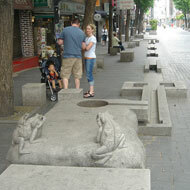 Integrate adjacent uses with the sidewalk articulation like providing seating near cafes. Incorporate vertical elements, such as lighting, shade structures, trees and planting, to bring human scale to the street. 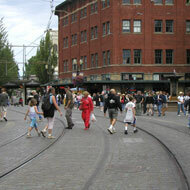 Create streets that are flexible and can accommodate a wide scale and range of activities. Incorporate movable features, such as seating, container planting, screens, bollards, etc., that can be used to change the size and scale of spaces. Create policy and permitting guidelines that enable the street to be used for a diversity of social gatherings through street closures, event permits, etc. Provide elements that allow for change in usage depending on time of day or year, such as temporary shade structures, lighting, etc. places for shared public services and experiences. Provide neighborhood exchange stations for books, clothes, etc. 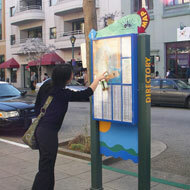 Provide community notice boards for announcements of community events and services. 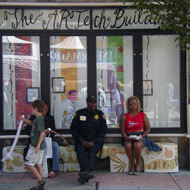 Provide idea walls for people to share art, poetry, and stories about the community or neighborhood. Set up speaker corners that encourage public speaking, debate and discussion. Use virtual social spaces to promote the use of physical social spaces. Facilitate and support the use of applications such as Foursquare that allow people to “check in” at public places. Use mobile applications that allow users to report maintenance issues to agencies. 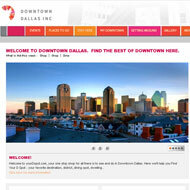 Provide online review sites for public spaces. Promote online community notice boards. 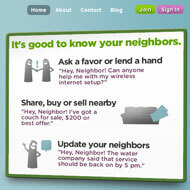 Promote online sharing forums to encourage social contact among neighbors that translate into meeting in person. Use social media to connect residents to opportunities for social events in the neighborhood and on the street. Develop human infrastructure to create and support physical infrastructure for social gathering. Involve the community in creating social gathering places in conception, construction and maintenance. Establish business improvement districts and/or neighborhood associations, and encourage their partnership in continued financial support and maintenance of social gathering spaces. 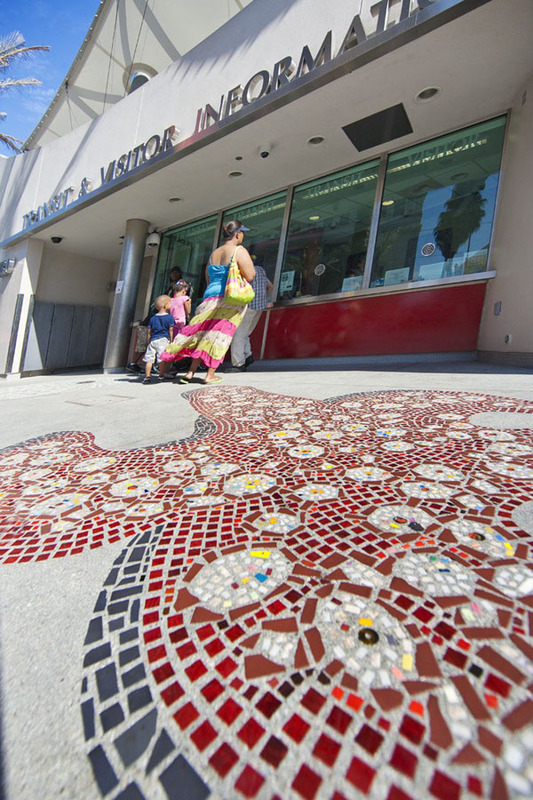 For example, encourage community members to maintain the special materials and furnishings used to create the social gathering spaces, such as San Francisco’s Pavement to Parks program. 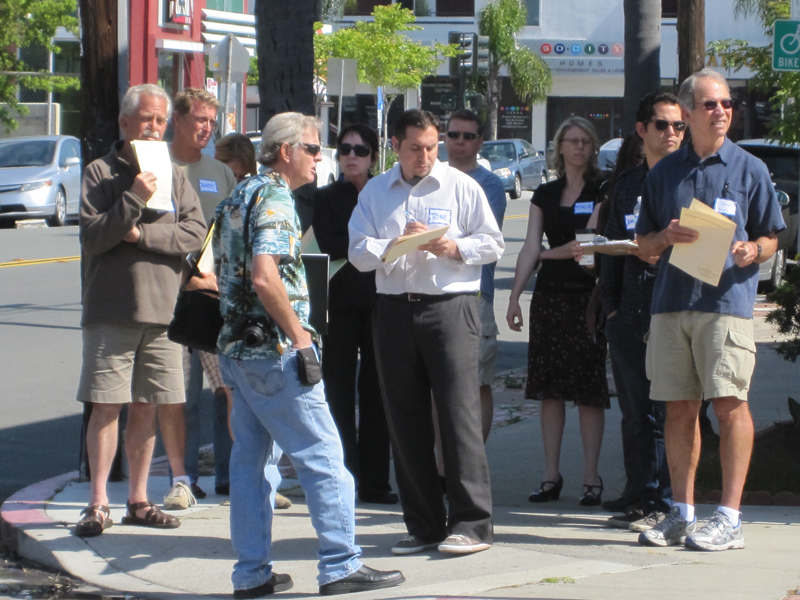 Create a street docent program to provide tours of the neighborhood. 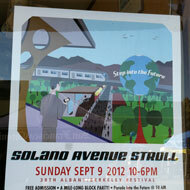 Provide the appropriate traffic condition to host programs and events within streets. The needs of each event and its physical environment should be analyzed to determine the best setting for a specific event. Streets could be closed, partially open, or open, depending on the safety and space needs for the event. 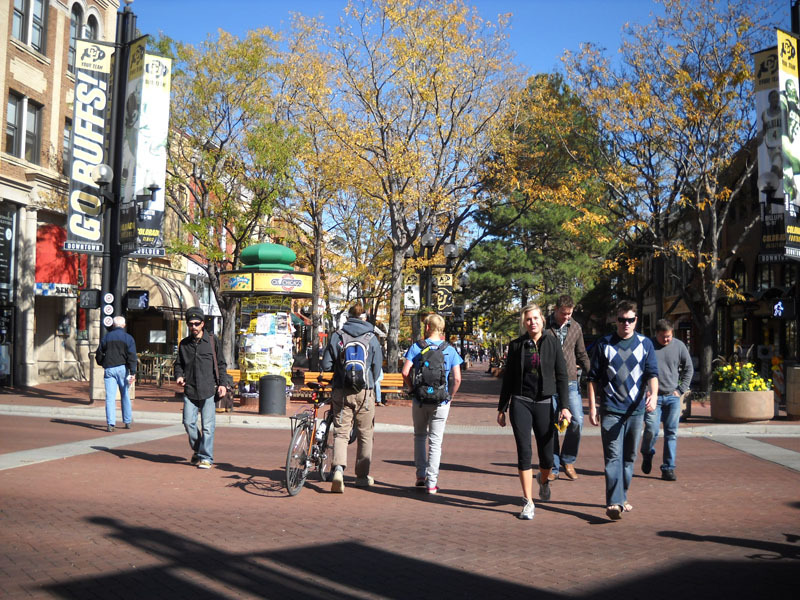 Closed streets best accommodate larger crowds, provide a higher level of safety, and most strongly promote the use of alternative transportation modes. Create a well-planned event that meets community goals, is well advertised, organized and operated, and, when possible, minimizes disruption to the neighborhood. Determine the best sponsor or type of organizing body for the event, such as local government, existing or new nonprofit organization, etc. Determine the best means of oversight: committee, board of directors, etc. Identify the event location and the type of street setting that is most appropriate for the event: closed street, partially open street, or open street. Consider a variety of funding sources, such as government agency sponsorship, grants, corporate sponsorships, and fees and charges, such as admissions, booth fees, or parking/bike parking fees. Obtain necessary permits, and work with government and law enforcement to obtain approvals. Identify staffing needs, including volunteer coordination, recruitment and supervision. Develop partnerships and advertising trade with big and small media outlets, including both old and new media types. 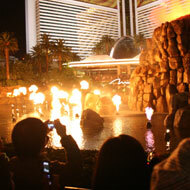 Develop a communications plan to publicize the event, including use of social media. Communicate with businesses and residences along the route about altered access, if any, and alternatives during the event. 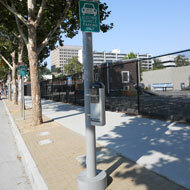 Plan for event access, such as transit access, bike parking, auto parking, and event shuttles. Work with law enforcement and fire officials to identify security needs and access needs for emergency vehicles. 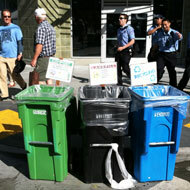 Develop plans for trash recycling and collection. Consider creating a kit of reusable event dishes and silverware that can be checked out by community groups for small events, such as block parties. Provide training for staff and volunteers. Designate and locate events to meet requirements for public access, safety, and maintenance needs. Select streets with minimal slopes along the event route (except in the case of ciclovias). Select streets that have appropriate connectivity from multiple modes of transportation, including automobiles, transit, bicycle, etc. Select streets that ensure emergency access for fire, police and medical services, especially when temporarily closing the street. Select streets that offer easy sight lines for police, event security personnel, etc. Select streets that have been designed to accommodate ADA needs. 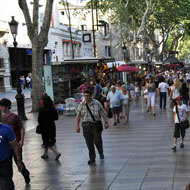 Designate streets corridors that are large enough to accommodate pedestrian circulation. Select streets that are flexible enough to accommodate large portable equipment. Designate streets that do not have materials (sidewalk paving, special lights, etc.) that will get be impacted by heavy foot traffic, wear and tear caused by the movement of portable equipment, etc. Select streets that provide access to utilities and waste disposal. 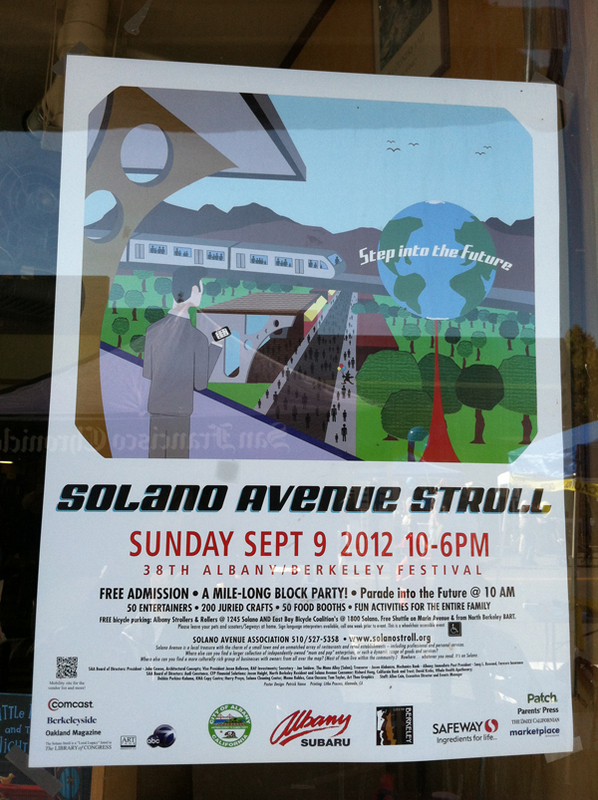 Select streets that provide convenient access to automobile parking (often in dispersed parking lots with transit shuttle service) and bicycle parking (at the event to encourage biking). Provide critical infrastructure and emergency access. Provide a means of temporarily closing the street, i.e., temporary fencing, etc. Provide essential portable elements such as seating, restrooms, water stations, etc. Provide additional portable elements that will facilitate events, such as performance stage, sound system, trash and recycling receptacles, etc. Design for adequate shade or weather protection. Design for temporary and permanent utility access to power electrical systems, disposal of water including wastewater and graywater, grease from food vendors, etc. Design space for emergency vehicle access, especially when streets are closed, either within a street traffic lane or along the sidewalk. Incorporate signage and wayfinding during events, i.e., devices that will accommodate banners that hang across the street at major intersections, a signage system for event directional signage, etc. 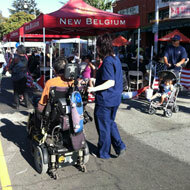 Customize the design of street to accommodate the specific events and programs. Utilize portable elements to support block parties in each neighborhood. 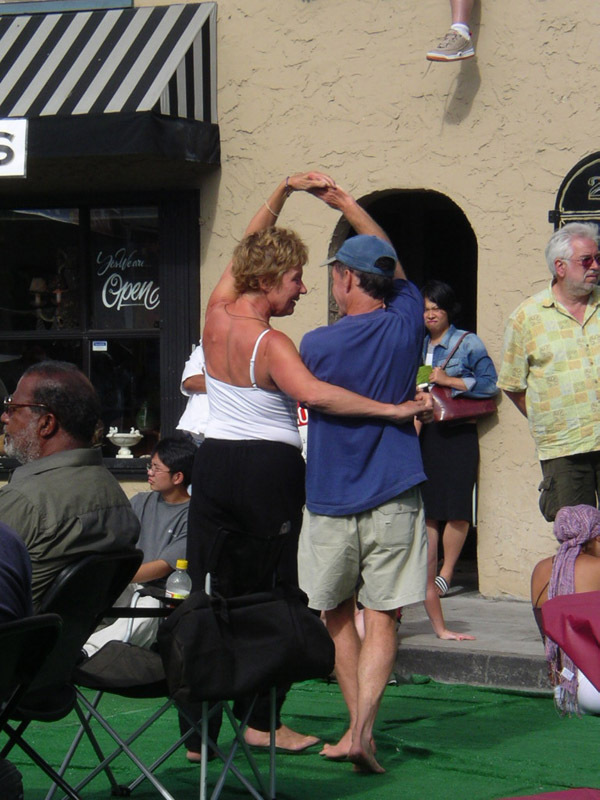 Where demand exists, consider developing a permanent neighborhood location that would accommodate a variety of street events, i.e., allow for convenient street closing, access to utilities, performance space, shade, etc. Partial street closure or full street closure should be considered. Enable play to happen in a safe way on the street. Locate play on local low volume streets. 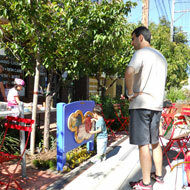 Explore play opportunities within the ROW of local residential streets. 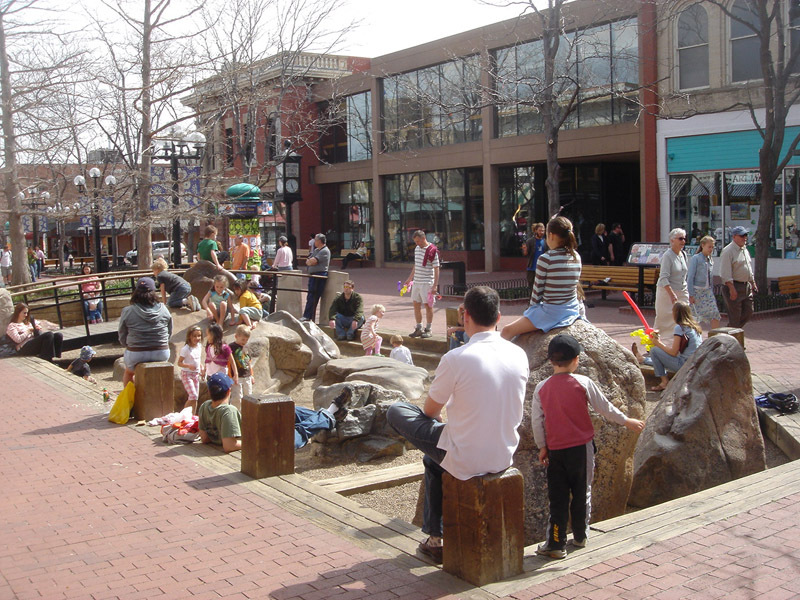 Explore play opportunities within the sidewalk and extended sidewalk (such as bulbouts, parklets, etc) on local mixed-use and commercial streets. Ensure that the traffic speeds on local residential ‘play’ streets that are not closed to traffic is about 5 mph. Ensure that the traffic speeds on local mixed use streets that are not closed to traffic and where play is allowed only on sidewalks is 10-15 mph. Choose temporary daytime or seasonal street closures to allow for play to happen beyond the sidewalk on heavily trafficked local streets. Address various traffic and parking impacts on residents fronting the street as well as the surrounding neighborhood during any closure of street for play. Apply play area safety standards as appropriate, such as providing as synthetic safety surfacing under climbing elements, to allow for safe play. Locate play areas where there are eyes on the street, such as by providing visibility from residences or other nearby areas. Design parking lanes and spaces to allow use of parking zones for play on local residential, commercial and mixed use streets. Encourage physically ‘active play’ on the street. 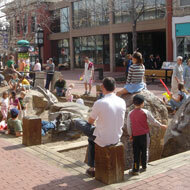 Provide sufficient open space on the street to accommodate active play in various forms. Provide play equipment that supports different age groups and provides a diversity of challenges. Provide natural play elements like boulders and trees for climbing. 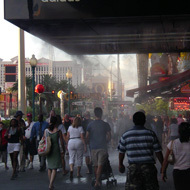 Include water spray play areas on the street. Provide infrastructure to allow for active games, such as goals for basketball, ball walls, sleeves for nets of ball games such as volleyball, etc. Provide outdoor exercise equipment, such as stationary bikes, parallel bars, etc. Use topography and grade changes, such as steps, slopes and mounds, to create opportunities for active games. Encourage children and adults to explore and engage in ‘free play’. 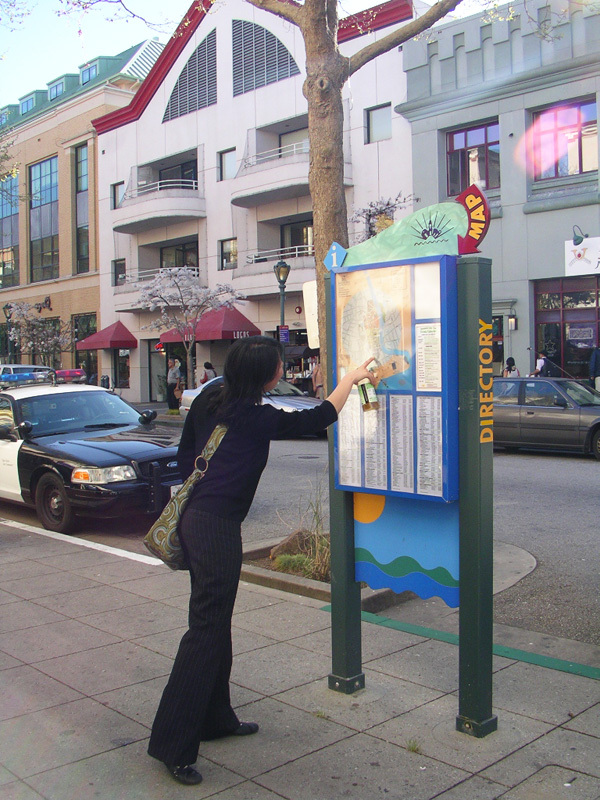 Include cues on the street that encourage the public to engage in play, such as interpretive signage, art elements, discovery maps and audio. 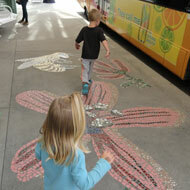 Use paving patterns to encourage pavement games on the street. Set up stage-like areas on the street to prompt imaginative and dramatic play. Encourage the use of plants that attracts insects, such as butterflies. Include plants that are child-friendly and can be harvested and used for play, such as bamboo. Provide plants with edible fruits and berries. Encourage ‘quiet play’ on the street for children and adults. Include drawing stations with easels, seating and access to water. Provide reading/storytelling nooks with comfortable seating, protected from the sun, wind and rain. Provide surfaces for drawing and stenciling on the street surface or walls. Include loose parts, such as sand and water, or natural materials, such as rocks and twigs, that encourage creative play. Allow space for temporal play activities. Organize play events on the street that use loose parts and play leaders to allow for adventure play on a temporary basis. 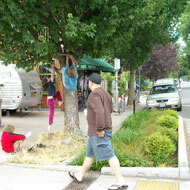 Organize neighborhood summer camps that include play activities that happen on the street. 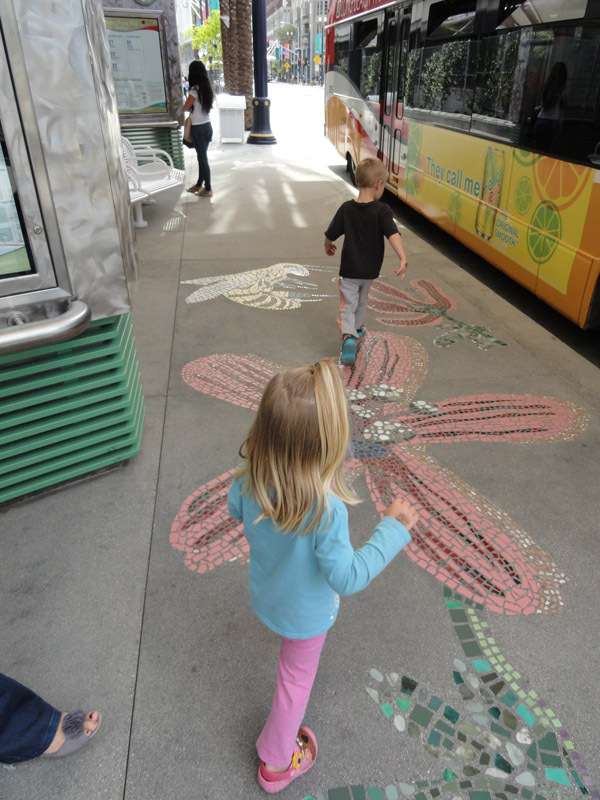 Organize regular play activities that focus on using street elements for play, such as chalking on the sidewalk. Encourage other kinds of mobility that encourage play as well as physical activity. 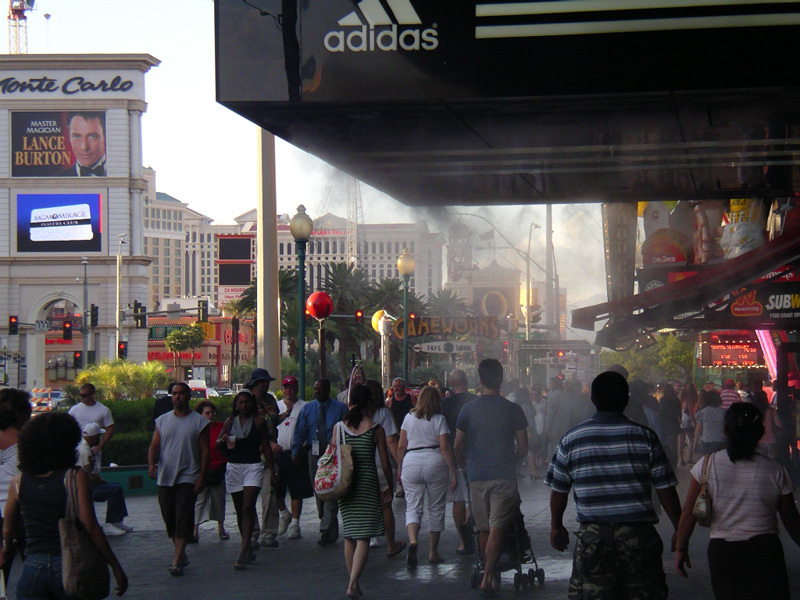 Incorporate elements that accommodate sports, such as skating lanes on the street. Provide street surfacing that is suitable for running and jogging. 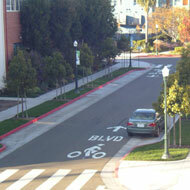 Provide street markings and signage to indicate trike paths. 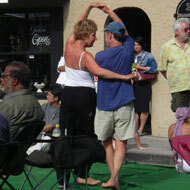 Organize dance or exercise classes that cater to older adults. 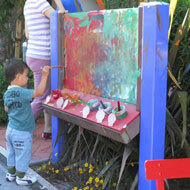 Integrate play that allows children and adults to play together. Locate play elements for children close to adult activities so it feels part of the whole instead of a separate experience. Include design elements that appeal to both children and adults, such as drums, other musical instruments, ping pong, chess, etc. Provide child-sized street furnishings adjacent to adult furnishings, e.g., child-sized seating elements adjacent to adult seating areas. Use play elements that enable discovery and learning of the physical context. Include elements, such as interpretive signage, murals, artifacts, etc., about the historical or ecological context of place. Include play elements that respond to natural elements, such as sun, wind, water, etc. 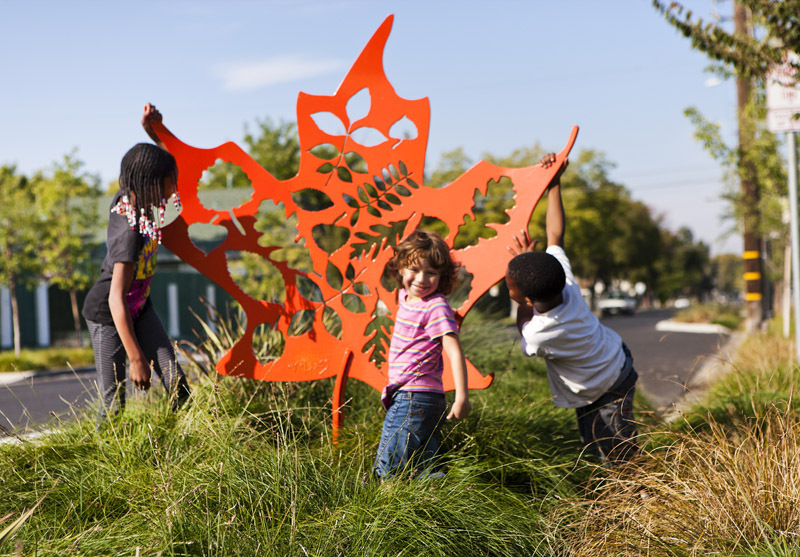 Include play elements in the form of sculptures that are based on the local flora and fauna. Ensure that the areas where street play happens have a optimum level of comfort and convenience. Locate play elements so that they are visually and physically accessible. Provide a variety of seating that is comfortable and convenient like “plop benches,” which are larger in size than regular benches and provide caregivers extra space to sit with all of their belongings. Provide amenities, such as trees, shade structures, drinking fountains, lighting, restrooms, space for stroller parking, etc., as appropriate to the location. 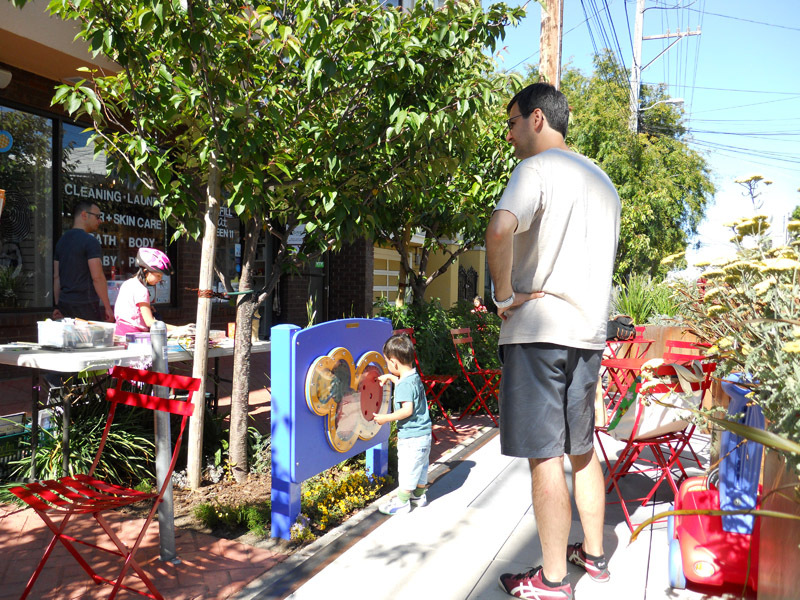 Make play on the street accessible and affordable to build and maintain. 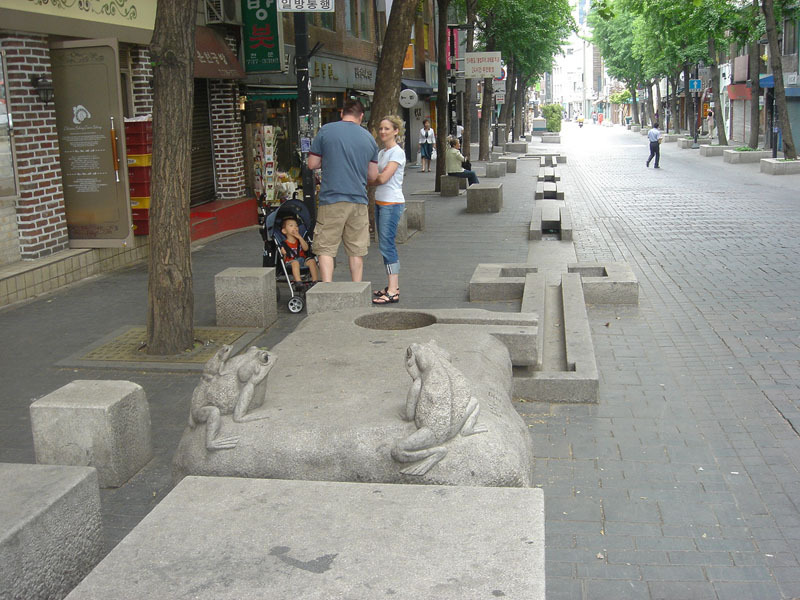 Create well-integrated street furniture that is multi-functional, and include play elements, such as benches, that are also designed for climbing or sliding. Provide adjacent storage areas for loose parts and tools for self-cleanup, such as brooms, etc. 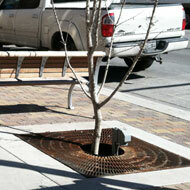 Use rubber surfacing around trees to prevent heaving of the sidewalk. Provide low-cost loose part play kits on loan to groups organizing play streets. Create neighborhood “scrap stores” that can collect and distribute loose parts and other play materials. 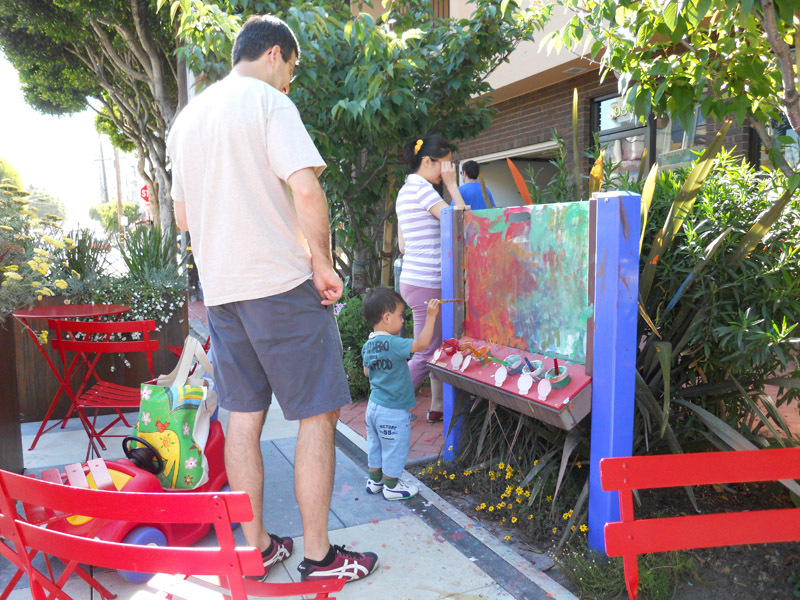 Create mobile play units that can travel and bring play to the street in a variety of neighborhoods. 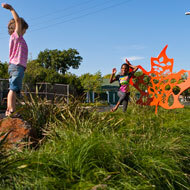 Create “human infrastructure” to support the physical infrastructure created for play. Involve the community through conception, construction and maintenance. 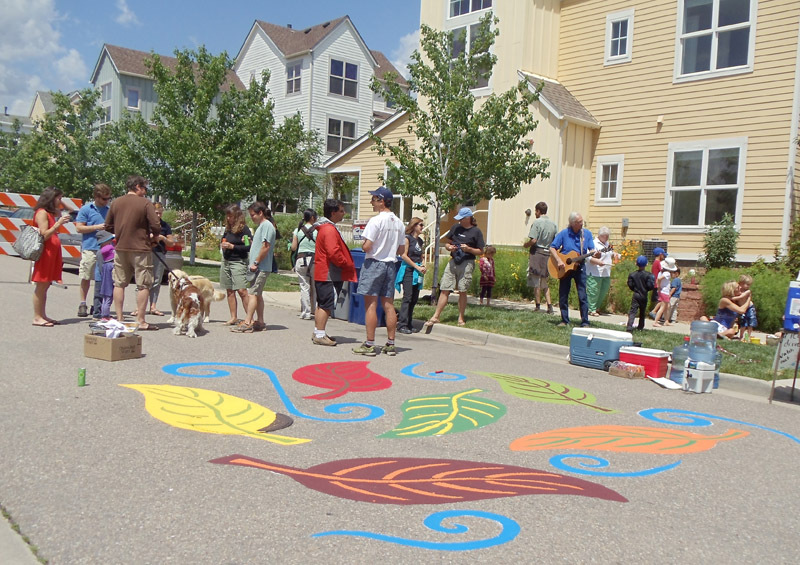 Form a citizens group (e.g., Boulder Tomorrow) or partnership (e.g., Central City Neighborhood Partners) that takes ownership of play elements and programs. Have trained neighborhood play leaders to champion play on the street. Use social media to connect parents and children to play opportunities in the neighborhood and on the street. 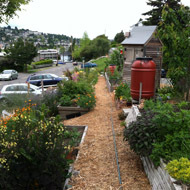 To the largest extent possible, locate urban agriculture on local streets and ensure that it is compatible with adjoining land uses. Select streets with traffic speeds that allow various activities, such as planting, weeding and harvesting, to be conducted safely and conveniently. 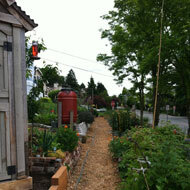 Locate urban agriculture on streets that generally have traffic speed of 15 mph. 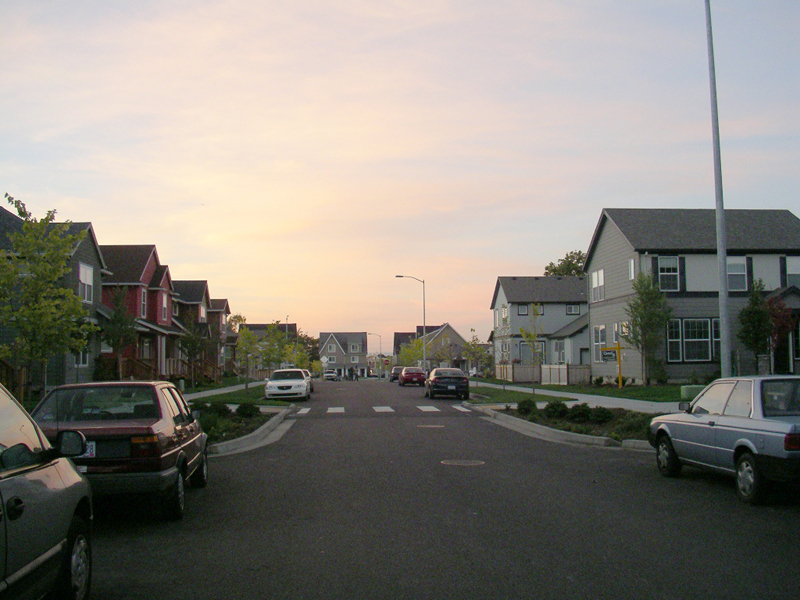 Select residential streets with a right-of-way of 50 feet or more and relatively low traffic volumes. 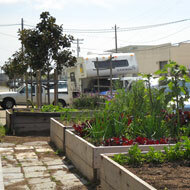 These streets provide the greatest opportunities for urban agriculture within planting strips, medians and bulbouts. 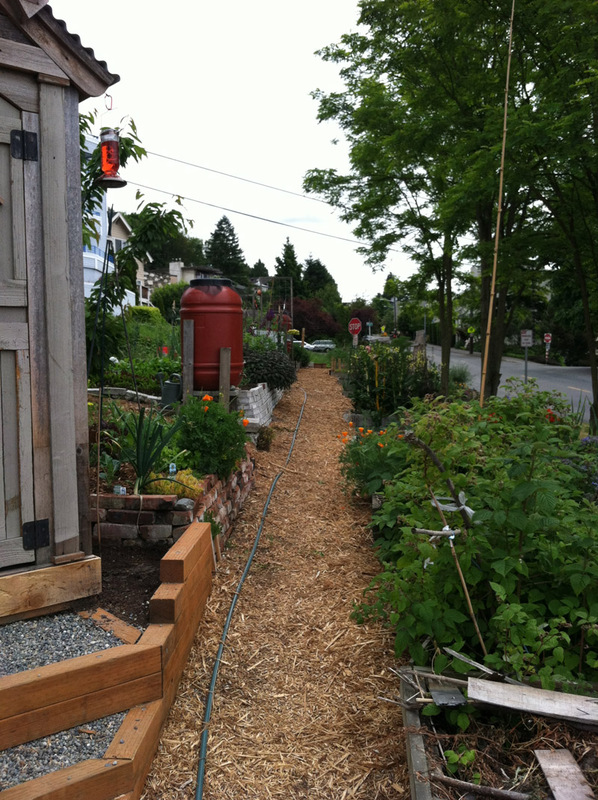 Explore urban agriculture on local commercial streets that provide similar opportunities as residential streets. 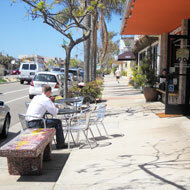 However, commercial streets need to respect the needs of the adjoining land use, such as outdoor dining. 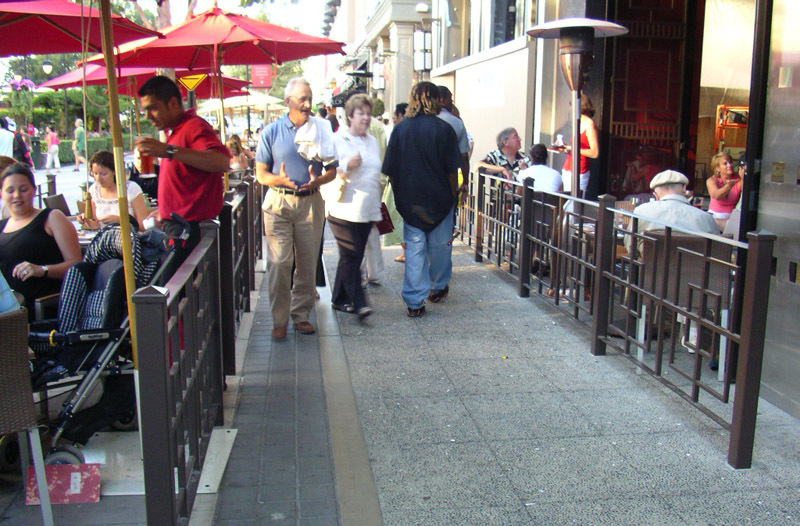 On sidewalks in mixed-use commercial corridors, demarcate outdoor dining and retail areas with raised beds or pots instead of conventional railings to provide a desirable advertisement for uses such as restaurants, cafés, gardening stores, etc. Ensure planting beds do not in any way impact the need for a contiguous ADA-compliant pedestrian path. Locate in communities that have expressed interest in having agricultural areas and thus can be relied on to maintain these areas. 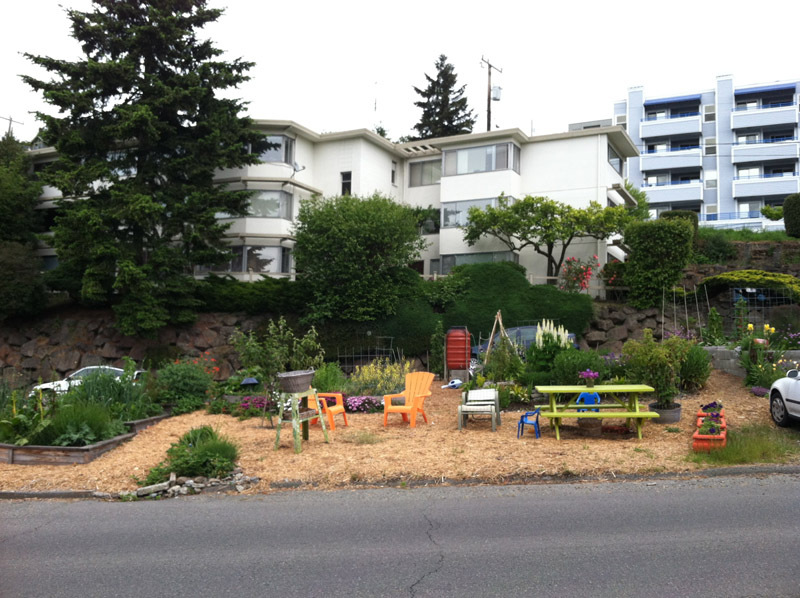 Provide urban agriculture areas in high density neighborhoods where access to private open space is scarce. Explore providing urban agriculture in residual spaces, such as the right-of-way along railways and freeways (e.g., cloverleaf interchanges and land adjacent to on- and off-ramps). Provide adequate buffer from planted areas to allow other street activities such as parking, driving and walking to amicably coexist. 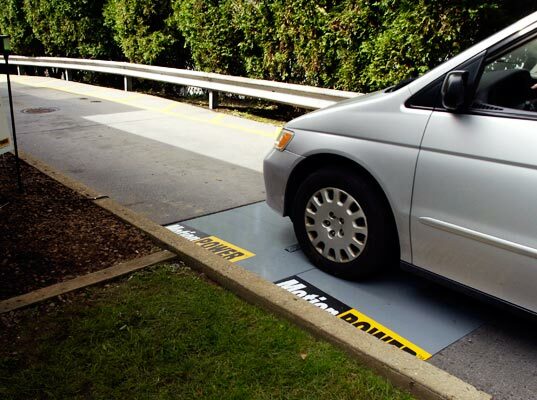 Provide about a 2-foot buffer for planted areas from the adjoining parking lane to comfortably allow car doors to open and for passengers to enter and exit a car. If the planted area is in a median or sidewalk next to a travel lane, provide approximately 3 feet as a buffer from the face of the curb. Ensure maximum exposure to sunlight and minimum exposure to wind. Locate the planting area so as to minimize shadows cast by nearby buildings and trees, and to ensure that the planting area gets about 6-8 hours of direct sunlight per day during the growing season. Orient the long axis of the planting area in a north-south direction to maximize sun. In areas prone to high winds, screen plants and use an irrigation system that reduces evaporation. Select appropriate planting palette, keeping in mind the physical and climatic context and the corresponding maintenance needs. Select plants that respond to the climatic context of sun, wind and rain. Plant sturdier plants along the edges so as to withstand automobile and foot traffic. Generally avoid crops that take a lot of space, like winter squash. Generally avoid high-value products that can be stolen, such as watermelons or sweet corn, unless appropriately fenced and policed by the community. Consider a variety of planting plans - from aesthetic, non-edible indigenous plants to fruits and vegetables - as a single crop and in complimentary crop patterns and relationships. Consider plantings that create environments that attract and support pollinators. 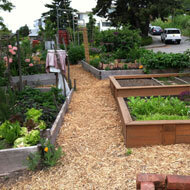 If using raised beds, balance the various and sometimes conflicting needs of cost, maintenance, access to sunlight, etc. 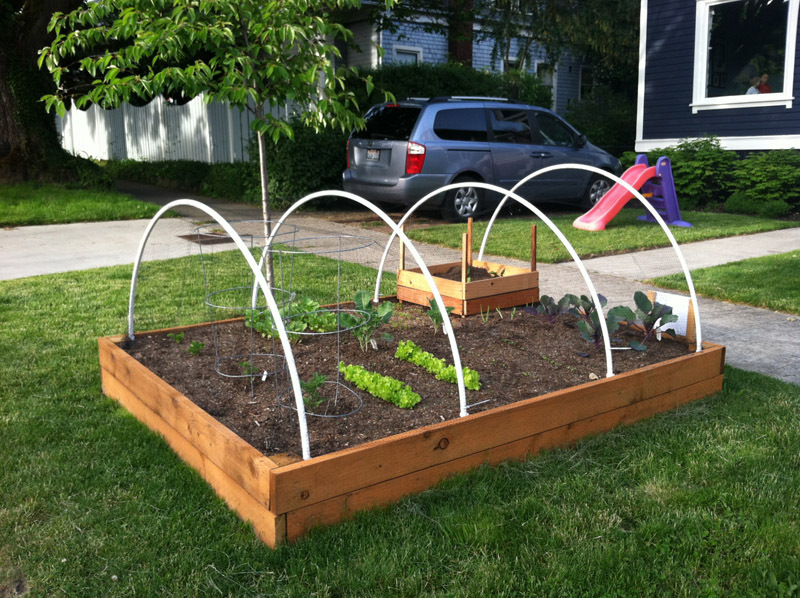 Ideally, design the raised bed to be a bottomless frame set into a shallow trench. Design the sides to be any durable building material with capacity and drainage that is untreated and non-toxic (lumber, layers of rock, cinder blocks, brick, concrete blocks, watering troughs, tubs, etc.). Generally, allocate 3 feet by 6 feet as a standard planting bed dimension. This dimension is big enough to support plant growth, but small enough to reach easily from both sides. 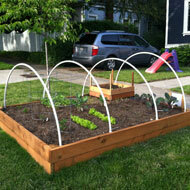 Design the raised bed to be 1-2 feet tall. Any taller may require an excessive amount of soil. Align rows to benefit maintenance and irrigation needs. Where possible, use a flat space so that walls are level. Provide an 18-inch minimum space between beds for walkways and maintenance, and a minimum of 36 inches to provide wheelchair accessibility and along major pathways which must be accessible. Ensure a proportionate amount of planters are universally accessible. Ensure that the soil should not just hold water but also have good drainage. Generally a sandy clay loam soil mixed with compost is best for most plants in raised beds. Soil depth in raised beds depends on the plants that will be grown. For shallow rooted plants such as lettuces and herbs, an 8-12-inch depth is considered a minimum. To be able to grow a wider range of crops, soil depth should be between 18 and 24 inches. When incorporating vertical gardens, respect and balance the functional requirements of the system with that of the streetscape and adjoining land uses. The plants should generally be south-facing with the vertical structures located on the north side of the plants they support. Locate next to undesirable blank walls of adjoining land uses. Where possible, it is helpful to have a large, sturdy, continuous, accessible wall to attach the garden. Maintain overall street visibility by ensuring visual connection between different users of the street, including pedestrians, bicyclists and automobiles, and nearby neighbors, such as residences and businesses. This encourages eyes on the street approach. Users of adjoining buildings should not be impacted by the height of the vertical walls. Consider the management needed for plants that will grow vertically and the reach needed to manage/harvest these plants. Also consider the use of basic pulley systems for maintaining hanging baskets. In places with harsh winter conditions, consider that living walls may have a dormancy period and may need extra attention to appear attractive all year. Incorporate pest and pet management strategies. Diversify vegetables to minimize damage from any one pest or disease. Explore using insects that feed on pests, like predatory wasps. Use buffer zones with border area plantings (e.g., Queen Anne's lace) to encourage pest enemies, such as ladybugs. Encourage plants that provide habitat and food sources for beneficial insects. Monitor the planted areas regularly to check for any changes or disease. Ensure timely harvest management so that food is not left to waste or rot. To avoid waste matter on edibles, consider raising planters to a height that is out of reach of larger pets. Create a holistic ecological connection to the larger green infrastructure network to create opportunities for beneficial animal and insect species to use the area. Practice seasonal crop rotation to reduce soil-borne diseases and to help maintain soil structure and fertility. Ensure the exclusion of toxins in the planting areas. Select appropriate planting species to minimize and mitigate any toxins present in the soil or when irrigated by stormwater. Monitor water quality of stormwater run-off used to irrigate edible plants. Use only non-treated wood and non-toxic material where food plants are growing. 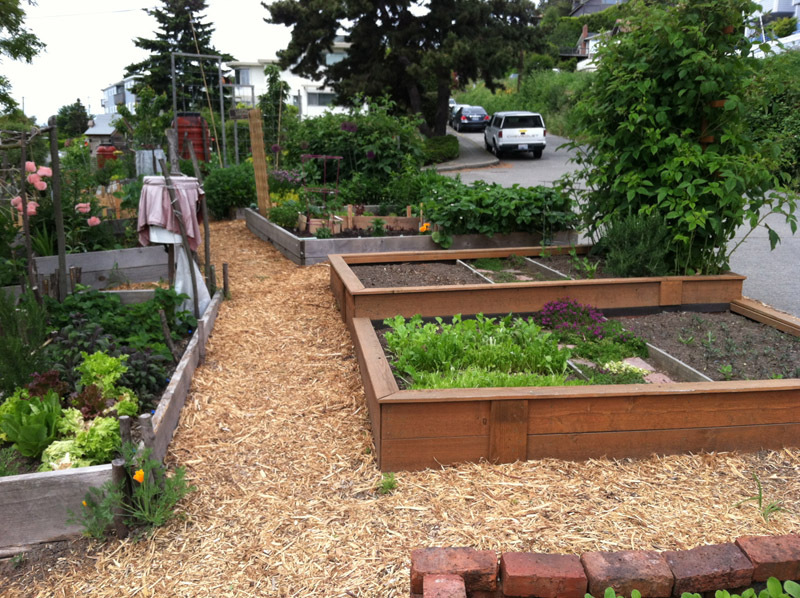 Where possible, use raised beds. Grow crops that do not have deep roots. If using existing on-site soil, conduct soil analysis regularly by a reputable lab, especially at the initial stage. 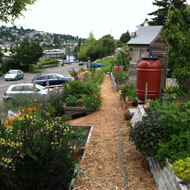 In areas of low rainfall, integrate stormwater systems into the urban agriculture. Integrate bioswales/rain gardens in sidewalk level planting areas and at street level to capture, filter and infiltrate rainwater. When using rainwater harvest, carefully select appropriate planting species to minimize and mitigate any toxins present in the stormwater. Irrigation of food plants that will be consumed by humans should be from a potable source or a recycled water source of appropriate quality to ensure safety. Consider water storage during summer months in appropriate climates. Use companion planting methods to create density and to shade the soil, lowering evapotranspiration. If using irrigation, explore various cost effective and water efficient irrigation systems. Use a battery-operated, automatic-control timer connected to an exterior faucet or hose-bib attachment. Use in combination with a hose end backflow preventer to prevent any contaminated water from re-entering a domestic water line. Use a pressure regulator downstream of the timer to reduce incoming water pressure to protect the drip system from having tubing pop off the fittings. Use a drip filter, with a minimum 120 mesh screen, downstream of the timer to remove sediment and other particles that may clog drip irrigation emitters. Pressure-regulating filters are available which combine both the pressure regulator and filter into one unit. Use a ½-inch poly tubing mainline as a distribution system. Tubing can be buried underneath the mulch layer. Water can be distributed using a combination of ¼-inch poly tubing with mini-jet sprayers or point-source emission devices and in-line emitter poly tubing to deliver water directly to plants. Consider the soil type of the areas to be irrigated when selecting the spacing and flow of the drip emitters. Consider the water requirements of each plant grouping and develop watering zones based on similar plant water frequency requirements. It may be possible to maintain a single zone by providing additional emitters or sprayers at the plants with higher water requirements to balance the system. Irrigate at appropriate times of the day when the water will have a chance to infiltrate and not simply be evaporated away. 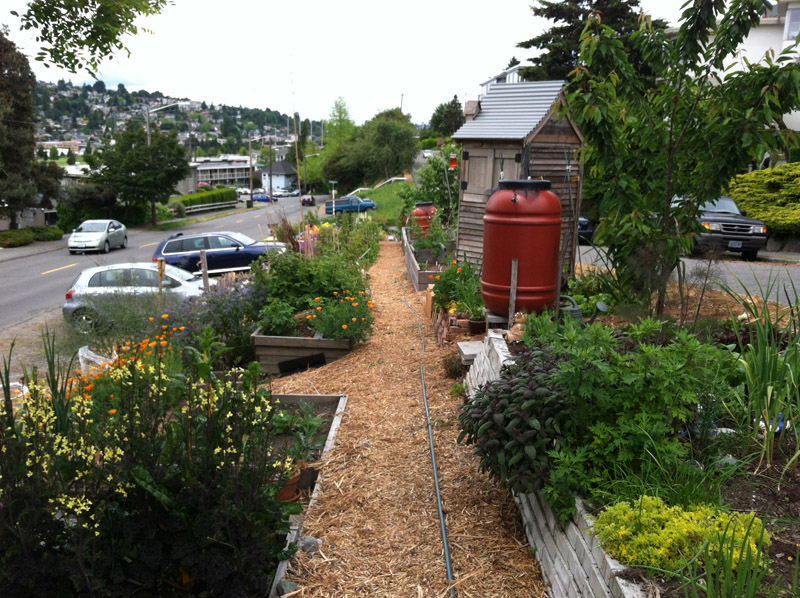 Provide necessary policy level regulations to support urban agriculture. Work with government agency staff to review existing regulations and how these regulations impact growing food in the streets. Where food is grown for selling, especially on residual areas next to the road, modify and change zoning regulations to allow the commercial activities of selling, buying and storing food. 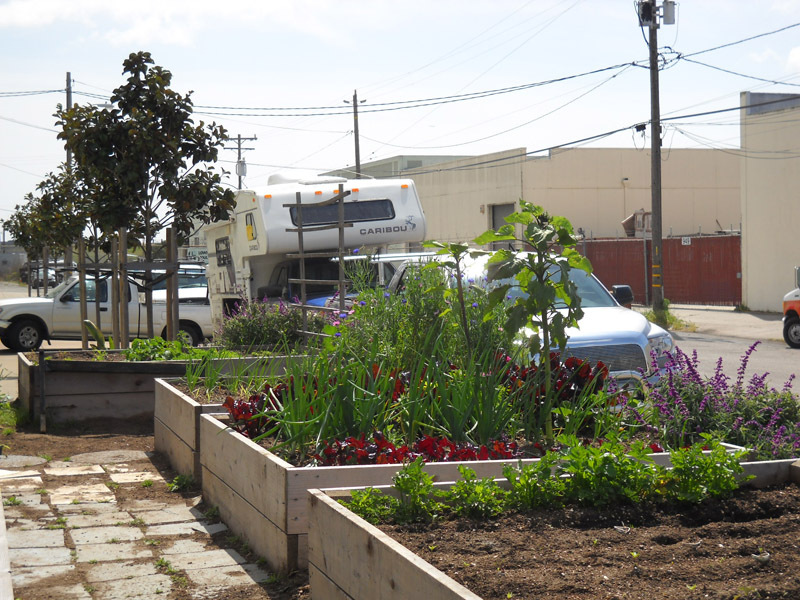 Explore incentives like reduced on-site parking and open space requirements if existing and new developments can help create significant opportunities for urban agriculture within the street right-of-way. 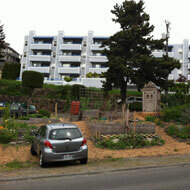 Encourage public and community participation in constructing and maintaining urban agriculture and minimizing vandalism. Install information kiosks on the street that explain the benefits of urban agriculture, and describe the direct benefits of sustainable food and associated benefits of rain gardens and sustainable infrastructure. Build partnerships with schools, youth organizations and farmers markets so that students, teenagers and interested members can learn about urban agriculture. Provide guidelines and training to the public for installing and maintaining urban agriculture through various forums and the media, including face-to-face workshops and the internet. Organize community policing and encourage neighbors and neighbor gardeners to keep an eye on the lots to minimize vandalism and crop loss. Work proactively with both visitors and adjoining residents and business owners not actively engaged in the urban agriculture project to increase awareness and understanding. 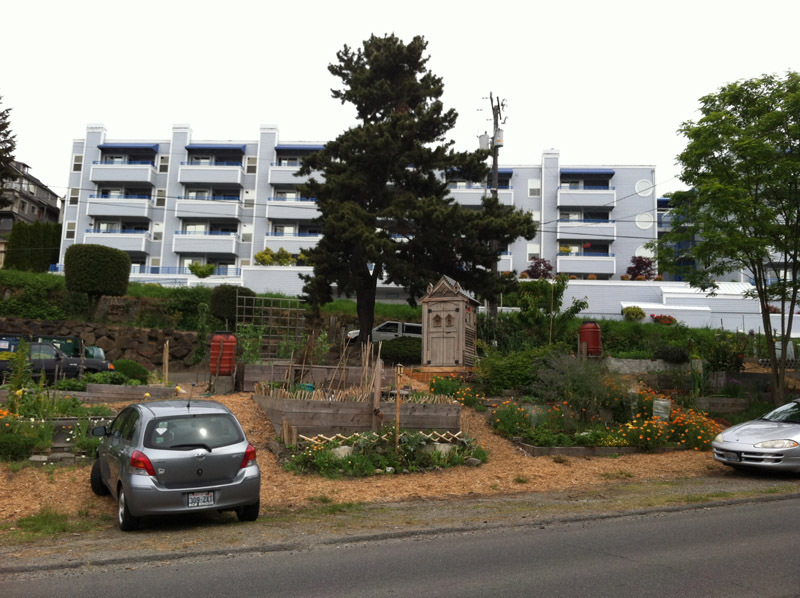 Explore sharing produce with neighbors and educating passers-by to build goodwill. Create a volunteer organization with a designated volunteer coordinator who interacts with the government staff to communicate and address various issues and needs. Actively engage private sector businesses, churches, and residents in maintaining and harvesting produce along with diverse stakeholders. Engage the large private sector workforce through volunteerism that offers hands-on charitable giving, outdoor exercise, and high-yield planting and harvesting plans with food benefiting the needy. Explore partnerships with various food venues, including food banks or low-income meal sites, cafes and restaurants. Explore coordinating with the network of Master Gardeners to provide training to community members. 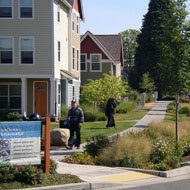 Integrate storm water systems into the built environment on the street. 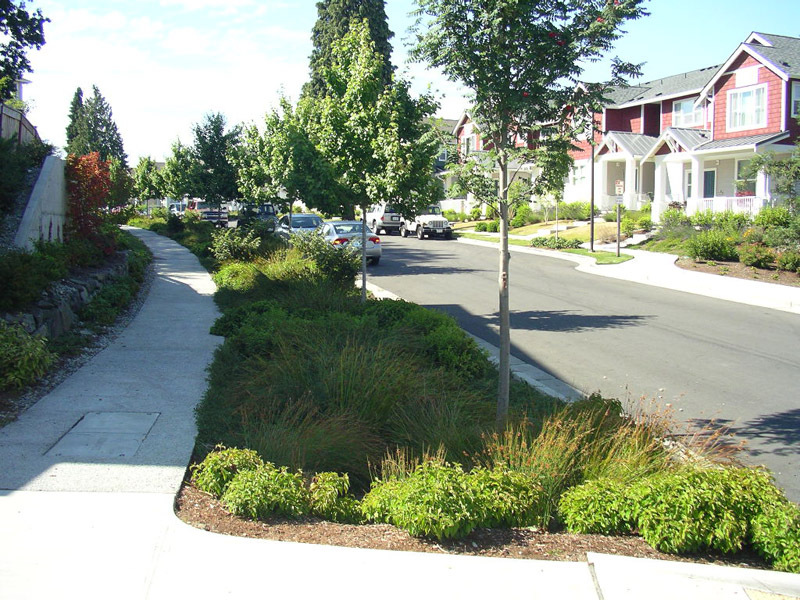 Include trees and bioswales/rain gardens in sidewalk level planting areas and at street level to capture, filter, and infiltrate rain water. 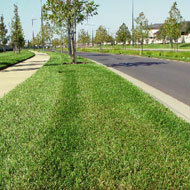 Allow curb cuts for inflow and outflow of the storm water runoff. 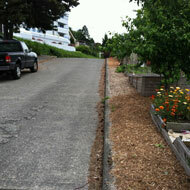 Include filter strips besides paved areas to slow the flow of storm water and reduce the volume of runoff. Use rain barrels and cisterns to collect storm water and use for irrigation. Replace solid coverage of asphalt or concrete with pervious asphalt, pervious concrete, permeable pavers, and plastic grid systems to allow water infiltration to tree root zones. 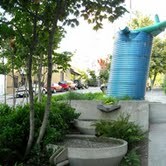 Build water storage vaults under impervious drive lanes and parking areas to capture rainwater and store it for reuse. Encourage a comprehensive approach to conservation designs. Maximize tree cover to reduce heat gain and storm water runoff. 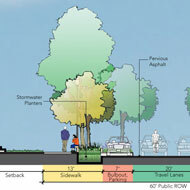 Make roads and sidewalks narrower and parking lots smaller to reduce total runoff. Preserve open spaces in designs to provide areas where water can infiltrate or evaporate. Incorporate natural methods of handling storm water to reduce the need for constructing large control devices. Implement the plan block-by-block to allow as much of the street as possible to remain open to reduce traffic impacts during construction. Identify and protect critical ecological hubs and linkages in advance of development. Use watershed approach to determine the best locations within a drainage area to place green infrastructure. 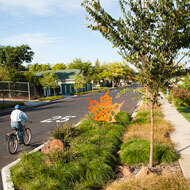 Use green infrastructure elements to improve street safety. Provide storm water curb extensions for safe pedestrian crossing. 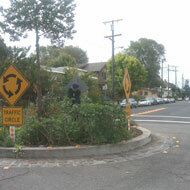 Provide a rain garden to transform awkward street intersections into safe pedestrian and bicycle crossings. Install LED street lights and guidance signs powered by solar energy to light walkways at nighttime. 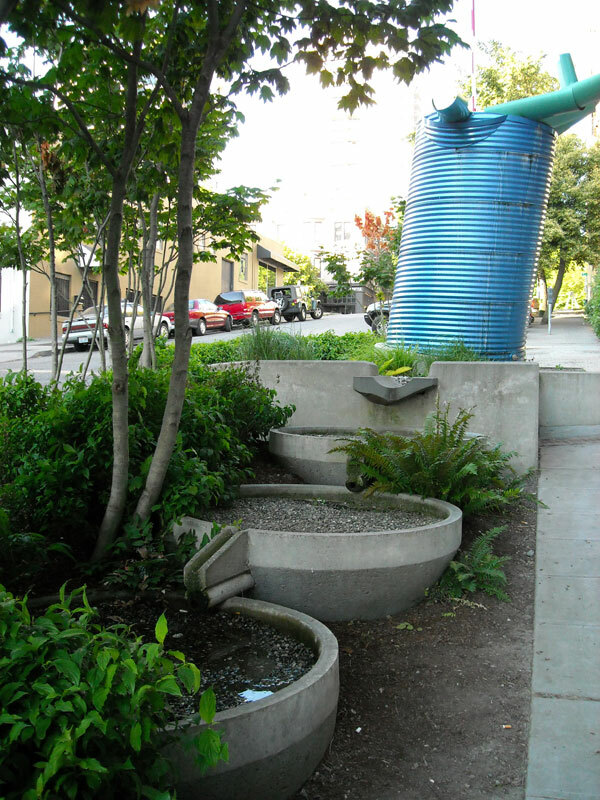 Integrate public arts into green infrastructure. 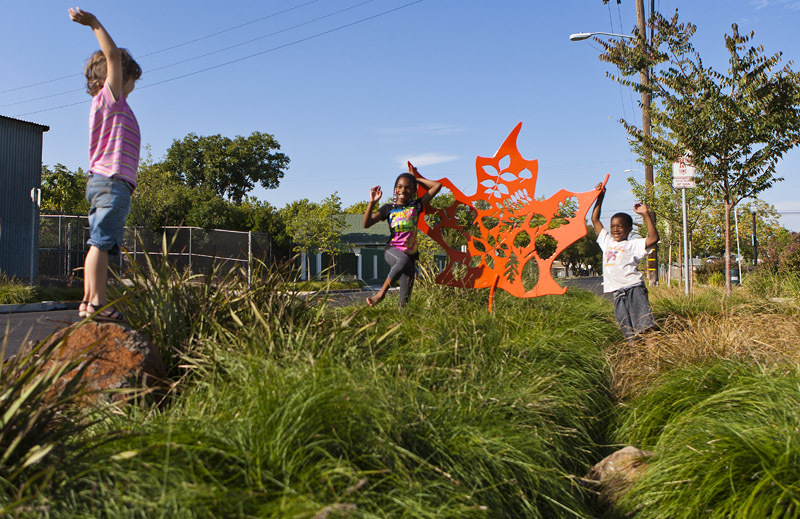 Use water art not only to collect runoff, but to change public perceptions about runoff. Install light art that can use kinetic energy from pedestrian traffic. 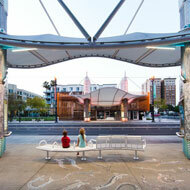 Design facilities that aesthetically enhance the community. Encourage public, business and community participation in constructing and maintaining green infrastructure. 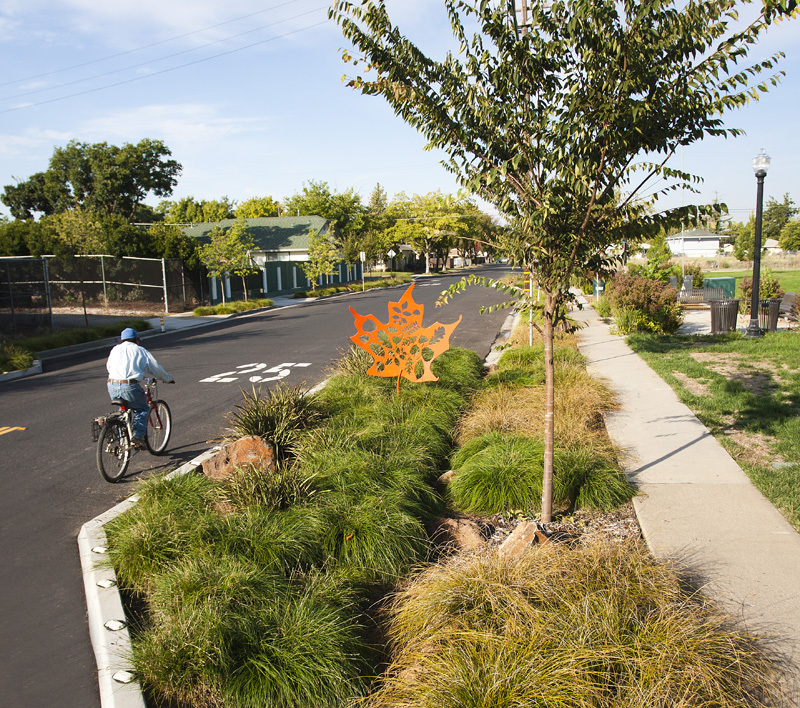 Install interpretive elements on the street that explain the benefits of urban trees, rain gardens and sustainable infrastructure. Build partnerships with schools so that students can learn about green infrastructure. Provide incentives, such as tax credits, to encourage installation of green infrastructure systems. 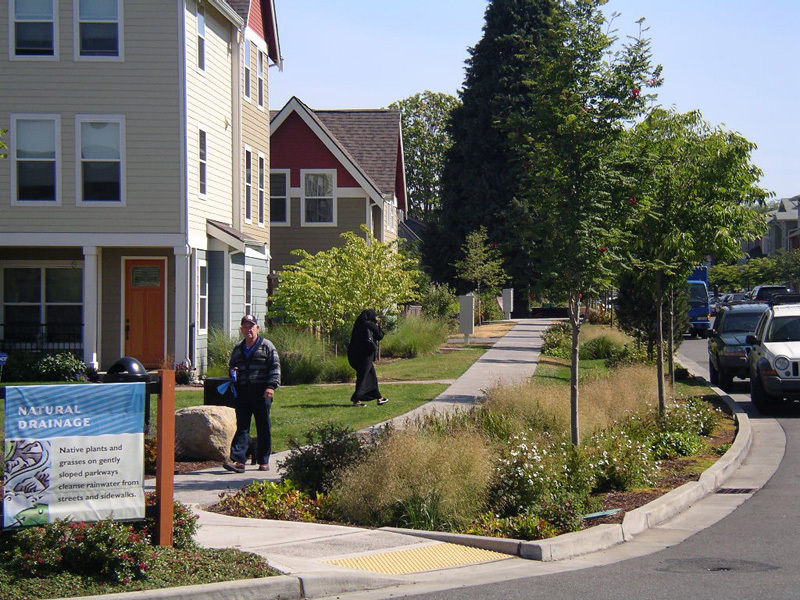 Implement ordinances and state laws that require integrated green infrastructure systems in every residential development. Form public/private partnerships to involve community groups and other stakeholders in the selection, construction and maintenance of green infrastructure projects. Encourage low-impact landscaping on the street. Provide supplemental measures to ensure that plantings can provide immediate facility function at the time of construction, reduce soil erosion and limit weed growth. Plant climatically appropriate native and non-native plants with deep root growth and pest-resistance to improve the long-term viability of the site while minimizing maintenance costs. Encourage a mix of native plants and ornamental plants to enhance diversity. 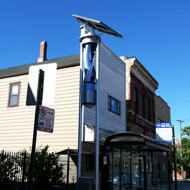 Integrate solar energy systems into the built environment on the street. Use stored solar energy from the road to heat and cool nearby buildings. Use stored solar energy from the road to melt the snow on the road. Generate electricity from solar energy systems to reduce use of fossil fuel and carbon dioxide emissions. Use stored solar energy from the road to power streetlamps and traffic signals. 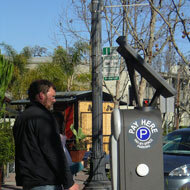 Install solar panels on parking meters to collect solar energy. 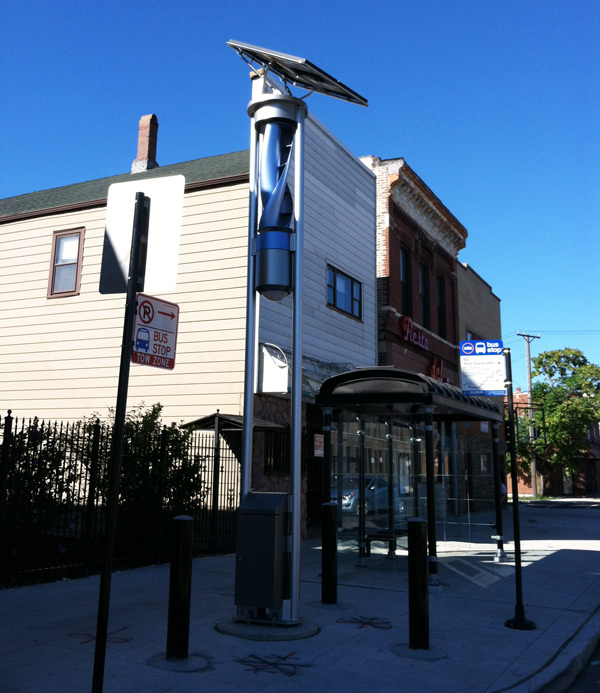 Install solar panels on bus shelters to power its lighting at night. Install solar panels on rail tunnels to protect high-speed rail from falling trees and to generate electricity. Encourage the harvest of kinetic energy from the street to generate electricity. Install speed bumps that can collect kinetic energy at transit depots where buses, trains, and vehicles are breaking heavily to generate power for traffic lights. Locate kinetic energy collectors along the railway to harvest energy from passing trains. Install kinetic energy collectors that generate energy through pedestrian traffic to provide illumination in dark walkways. Encourage use of recycled graywater from houses and buildings. Use graywater from clothes washers, bathtubs, showers, or bathroom sinks for outdoor irrigation. Install graywater diversion valves to separate graywater from blackwater. Install a graywater pipe outletting 3 inches above mulch to prevent roots from clogging pipes. Check the graywater system routinely to prevent it from emitting a foul odor or clogging with debris. Monitor pH and chemical readings to prevent damage to plants. Use green infrastructure to enhance the public realm. Locate green infrastructure near known community gathering spaces to improve the quality of the streetscape in these areas. Place green infrastructure near transit stops and other similar destinations. Ensure the street's design and material components speak to the aspirations, cultural preferences and expectations of the community. Select materials that are customized to celebrate the image and overall branding of the street. Select materials with high quality finishes, details and features that stand apart and provide lasting value. 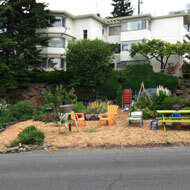 Where possible, use local materials and native plants to respect and showcase the local context. Use workmanship and technology that showcases local talent, artists and craftspeople. 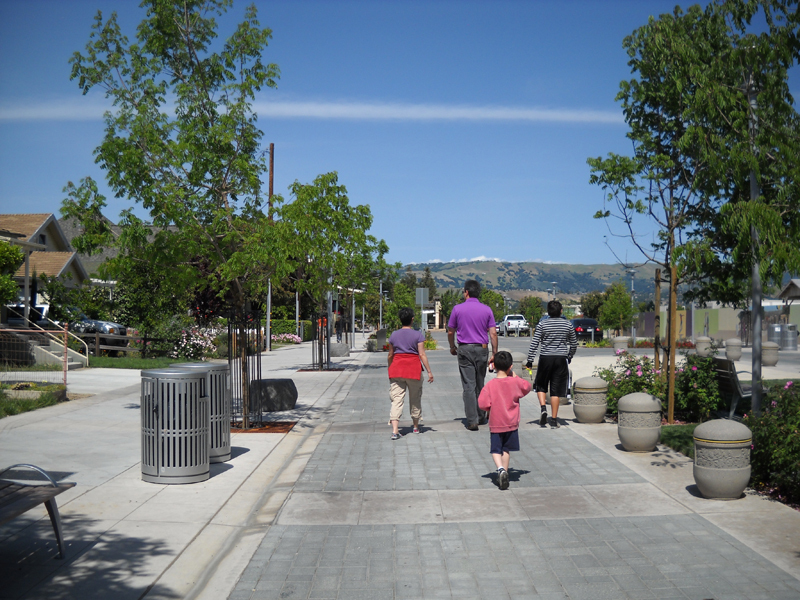 Gather user feedback on materials and proposed streetscape features during the design process. Create designs that minimize maintenance requirements. Encourage a safe and vibrant pedestrian environment. 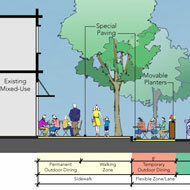 Provide wider sidewalks where desired or where need is demonstrated. 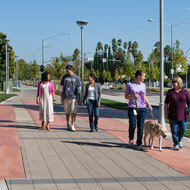 Design the travel way to ensure that the pedestrian is not impacted by fast moving traffic. Where needed, holistically integrate the traffic calming measures. Maintain visibility of the commercial space from the roadway. 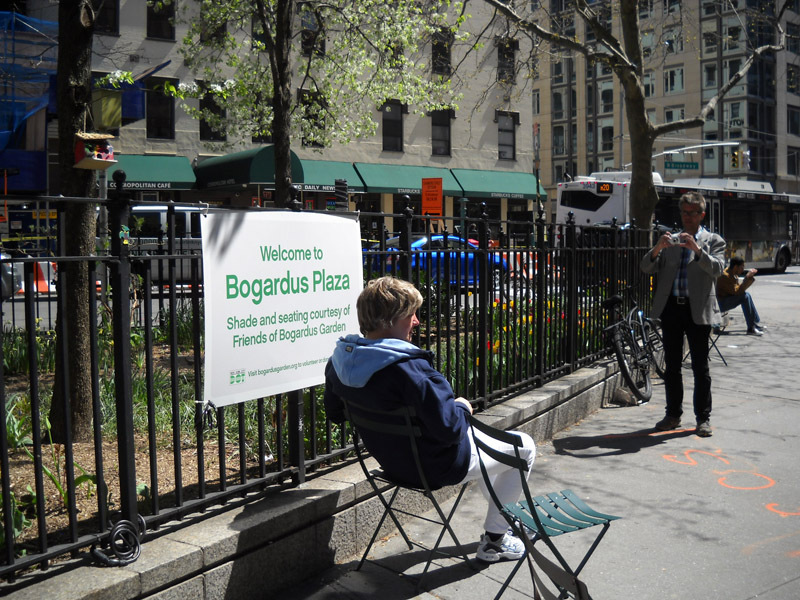 Provide outdoor seating near businesses, restaurants, cafes, museums, civic areas, or at resting or waiting places. 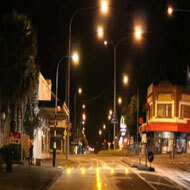 Provide lighting for environmental aesthetics, pedestrian interest and safety. Build new and enhance existing crosswalks for better pedestrian visibility. 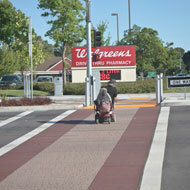 Use different surface treatments at specials destinations and intersections to enhance the walkable environment. 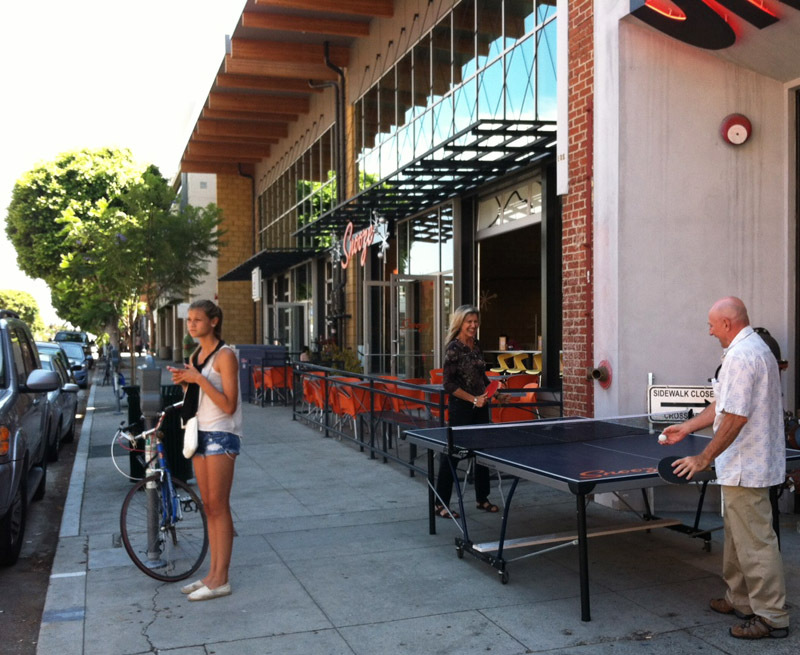 Encourage temporary/mobile commerce on the street to serve pedestrian needs. Provide amenities like street furniture, trash cans, drinking fountains, etc. 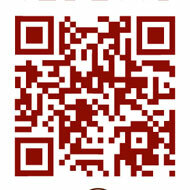 that provide support for mobile commerce. Incorporate utility infrastructure, such as electrical outlets, water source, grease drains, etc., into the street for use by mobile businesses. 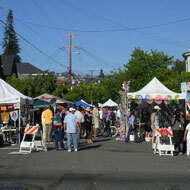 Organize street festivals, special events, competitions and farmers’ markets that utilize the whole street. Consider revision of overly restrictive codes/standards to ensure mobile businesses can compete with traditional business. Ensure maintenance of streetscapes that perform vital functions for commerce activities, civic duties, work centers and artistic expression. 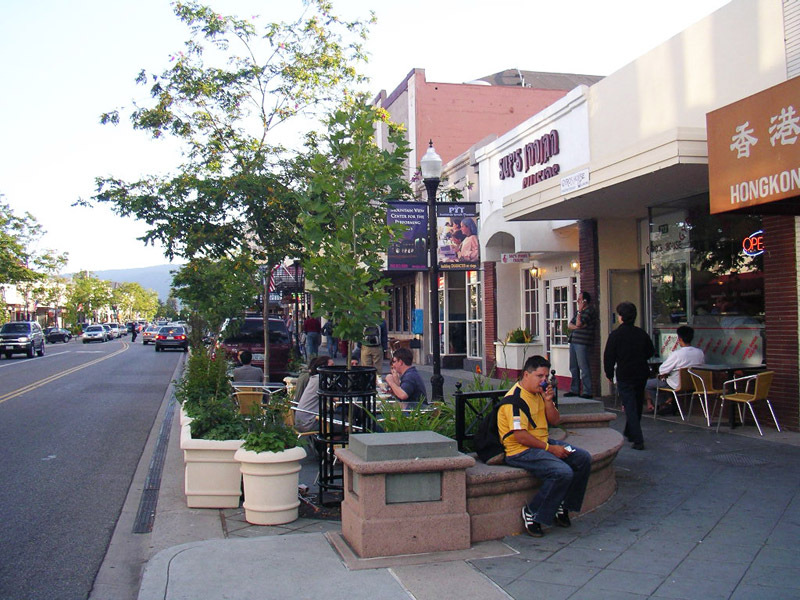 Encourage the formation of local improvement districts (LIDs) that address maintenance issues for a city’s iconic streets - An LID is a group of property owners that share in the cost of street maintenance, remodeling, lighting improvements, stormwater management, etc. 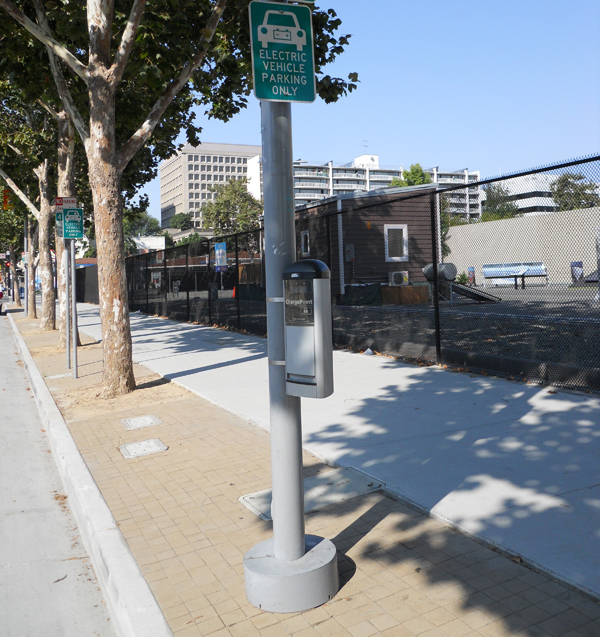 Encourage the creation of additional sponsorship and adoption programs to finance maintenance and updating of critical wayfinding elements installed in the streetscape. 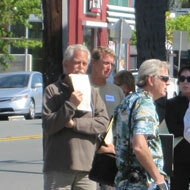 Work to identify the most appropriate group/agency to oversee street tree maintenance and upgrades along iconic streets. 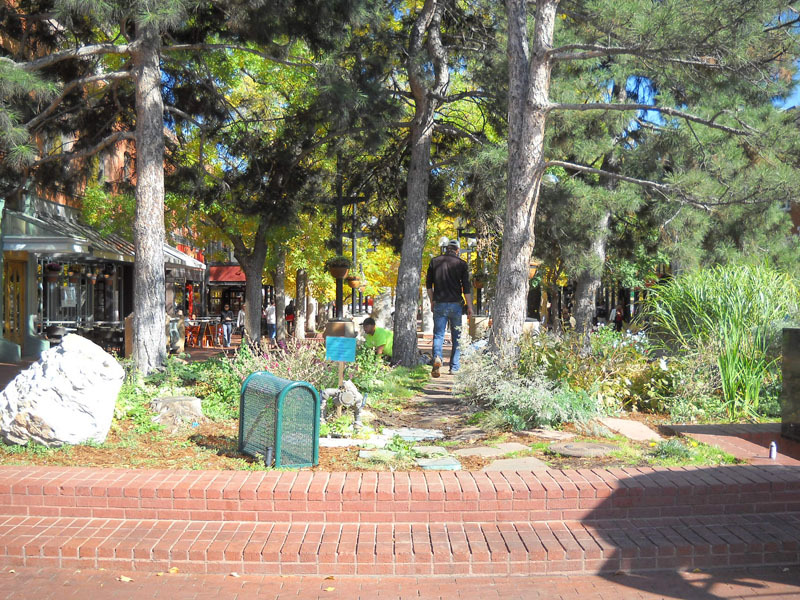 As streets receive new furniture, art, lighting, seating, planting, etc. require long-term maintenance contracts to ensure strong plant and tree establishment, and precedent for level of care for street furnishings. Develop maintenance programs and training to ensure appropriate care and upkeep schedules for streetscapes with needs beyond the existing protocol used by city maintenance workers. Use streetscape design that captures the unique history of the region. Hardscape and furnishing materials should feature locally derived elements of stone, ceramic, wood or other materials when possible. Design elements that speak to local manmade or natural features. Murals and art pieces should describe something about the street’s evolution, history or role in the city, preferably as part of a series of pieces that work together. Use caution with installation of stand-alone “plop art” that lacks local context or meaning, and ensure public art contributes to overall image and identity. 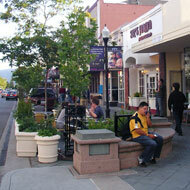 Integrate and emphasize existing streetscape features (cobble, door entries, fountains, etc.) in the process of a street’s redesign to show successive layers of building and history. Ensure that iconic streets are well-connected and easily accessible to all users. Improve pedestrian and bike connections to iconic streets. Locate transit stops at convenient locations and ensure that they happily coexist with adjacent businesses. 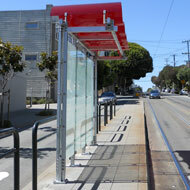 Ensure universal accessibility at transit stops. Provide a range of bicycle parking, short and long term, with better visibility along the streetscape. Design streets to quickly siphon vehicles into convenient parking facilities so as minimize negative impacts of automobile traffic. Emphasize and celebrate an irregular iconic street’s location and layout in the overall network of roads of the city, town or surrounding region. 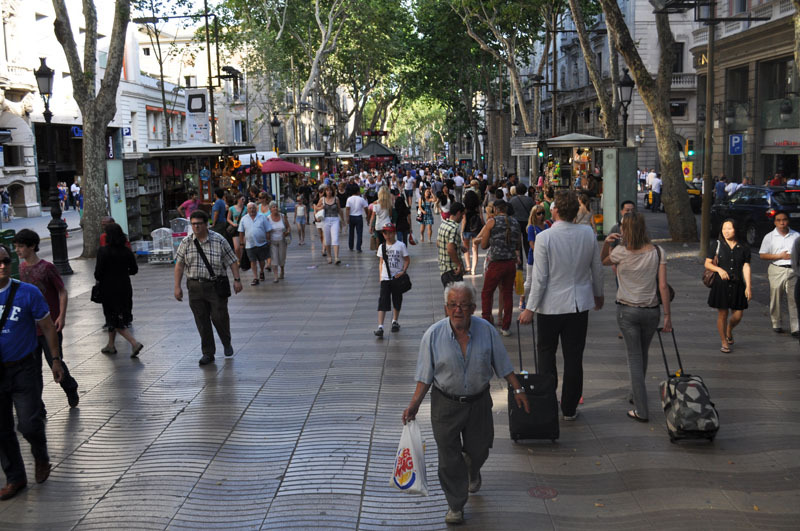 Where a diagonal street within a grid produces repeated residual spaces, create plazas, areas for street seating, mobile vending venues, tourist facilities, stormwater features, transit stops, etc. 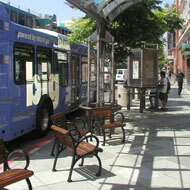 Design and locate street furniture such as custom seating that acknowledges and reinforces unique irregularities in the grid system. 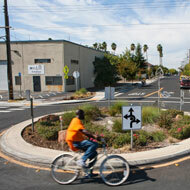 Design the intersections to ensure the safety and mobility of all users. 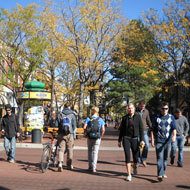 Program the street to encourage 24/7 environment, including active daytime uses and a vibrant nightlife, etc. 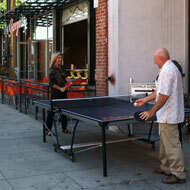 Encourage a true mix of dynamic uses to balance day and night activity levels, and mixed-use development. Work with transit agencies to provide night owl bus services along iconic streets with nightlife nodes. 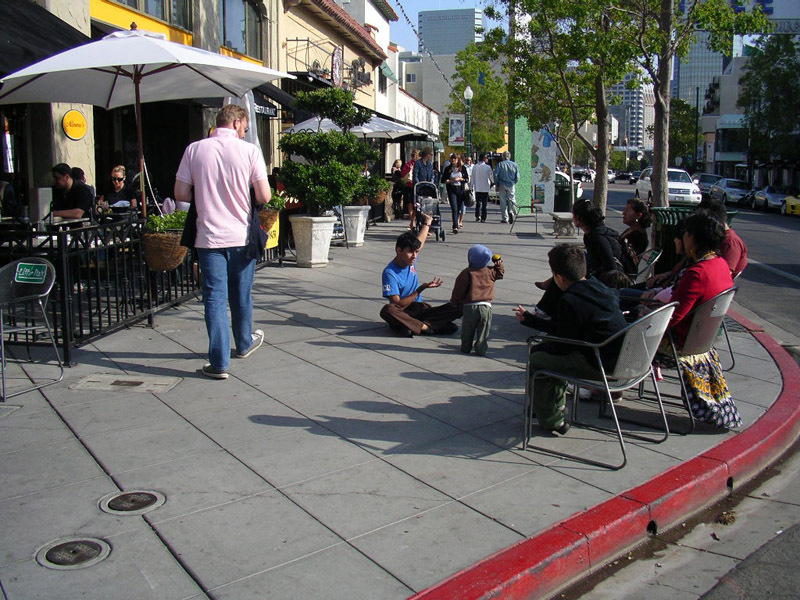 Encourage design of flexible-format public spaces along iconic streets - to be used as group exercise areas in early morning, food-vending locations during lunch hours, evening music and performance venues, and on weekends for rallies, marches, and farmers’ markets. Lighting should serve the range of uses and activities. Coordinate with businesses (especially retailers and restaurants) along iconic streets to encourage consistent operational hours. Design upper floors to provide places for people to gather on exterior balconies or overlooks. Where applicable, address snow storage and removal as a design consideration to maintain user-friendly streetscapes and walkable spaces. Partner with local organizations such as the chamber of commerce, local business associations, etc. to help host, fund and organize special events and programs.